This darkly mesmerising adventure, written by Doctor Who newcomer Sarah Dollard, and directed by Justin Molotnikov (Da Vinci’s Demons / Atlantis / Merlin), heralds a major turning point for the Doctor and Clara in series nine! When the Doctor and Clara respond to Rigsy’s telephone phone call to the TARDIS, they learn their friend has no memory of the previous day, his mobile phone has been damaged and wiped, and a bizarre tattoo has appeared on his neck. Determined to save him, their quest brings them to a hidden “trap street” in the city of London concealed by a misdirection circuit where alien refugees have taken sanctuary, there are many answers that must be found in this mysterious place, and what exactly is the chronolock? 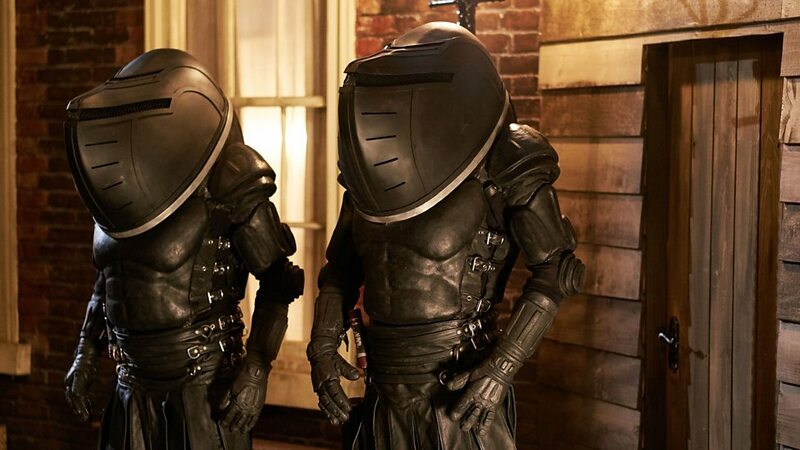 The Doctor and Clara must solve the bizarre murder mystery that Rigsy has inadvertently become embroiled in, which has left him sentenced to death for the murder of a Janus female (a dual faced alien species) that he cannot recall having any part of. The immortal Ashildr is also here in this secret street, she is now the self proclaimed Mayor “Me” of this alien refuge camp, and her motives are not quite what they first seem. As the tattoo formed of numbers begins counting down on the back of Rigsy’s neck, it’s almost time to face the raven! When Clara tries to help Rigsy, volunteering to accept the chronolock as Clara thinks she is safe because she is under Ashildr’s personal protection, the tattoo moves to her neck, but Clara has no idea of the terrible consequences this selfless act will ultimately mean for her. 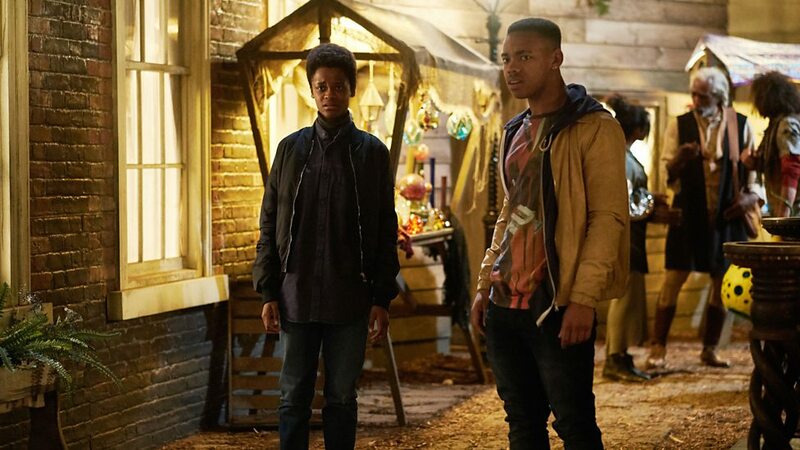 After they visit Anahson (Letitia Wright), the daughter of the murdered alien Anah, they learn Anahson has been dressing as a male to protect herself and hide her ability to see into the past and the future. 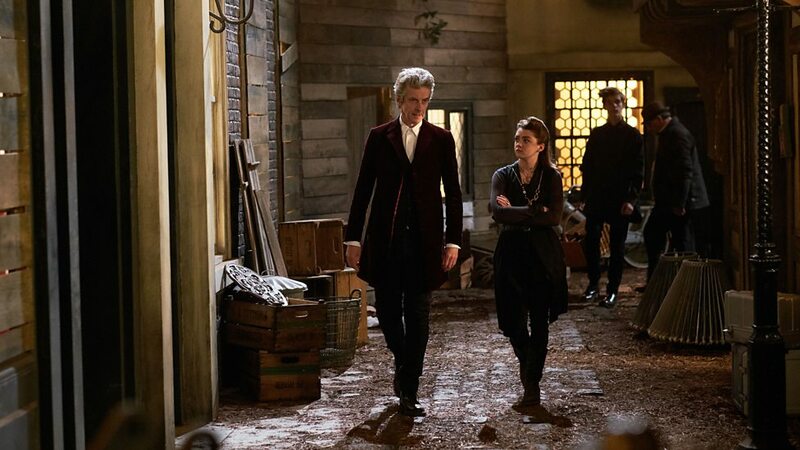 The Doctor, Clara, and Rigsy return to where the murdered Janus woman’s body is being held, whereby the full extent of Ashildr’s plan to lure the Doctor to the street is finally revealed. Ashildr might have trapped the Doctor, but she is devastated to learn what Clara has done, she never expected something like this to happen, and nothing can save Clara from facing the Raven. This is a terrific episode; Sarah Dollard has woven an intriguing mystery together with some particularly challenging issues, to make this one of the most emotionally charged and game-changing episodes of series nine. Director Justin Molotnikov really excels here, the secret trap street is populated by a wealth of disguised aliens, including the Judoon, Sontarans, Cybermen, Ood, and Silurians and the set design is fittingly dark and atmospheric to match the tone of the episode. The Doctor’s prompt cards from Under The Lake are used again, and his confession dial from The Magician’s and The Witch’s Familiar also returns. Peter Capaldi and Jenna Coleman give, quite possibly, their best performances ever in Face The Raven. What starts out as something as a quirky adventure soon becomes much bolder, darker, and unsettling, and the heartbreaking consequences of Clara facing the raven is sure to reverberate across all of time and space! The Raven is often associated as a portent of doom and death, the symbolism of how the raven is uses her is especially powerful. This story is also the first to feature the Doctor wearing his red jacket, a color that also symbolises this episodes themes of rage and death, another portent of things to come perhaps? 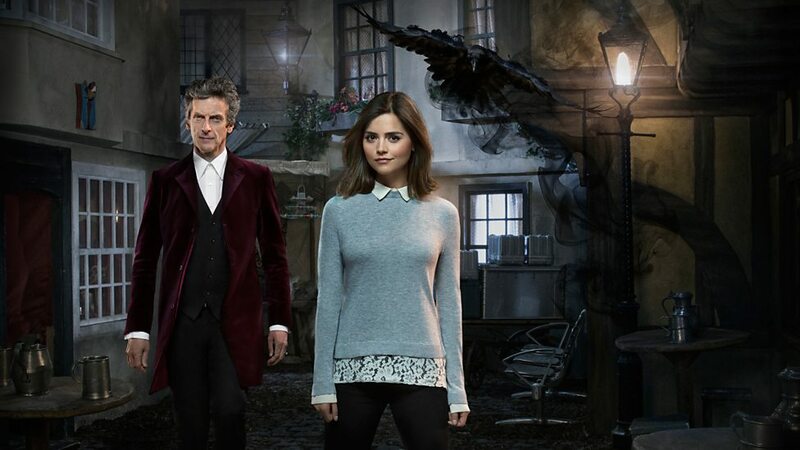 Face The Raven would effectively appear to be the first episode of three part season finale that will eventually culminate with Heaven Sent and Hell Bent. 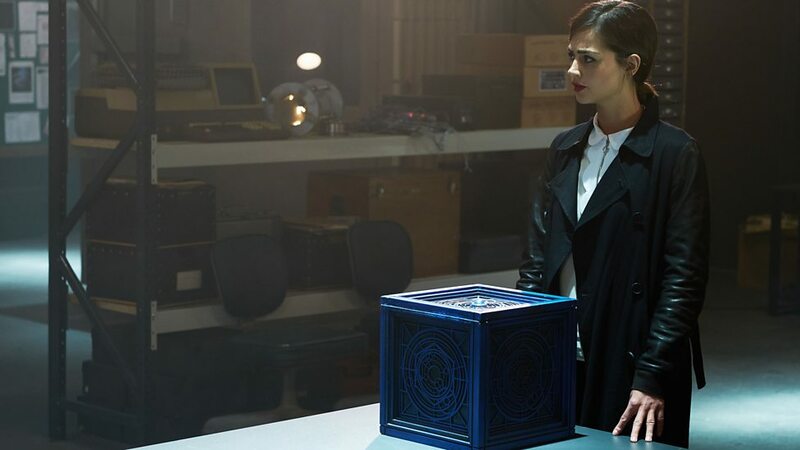 With Ashildr now in possession of the Doctor’s confession dial, the Doctor alone, and trapped in a strange land, series nine looks all set for a thrilling conclusion! And here’s a clip where Jenna Coleman reflects on her time working on Doctor Who with Peter Capaldi. 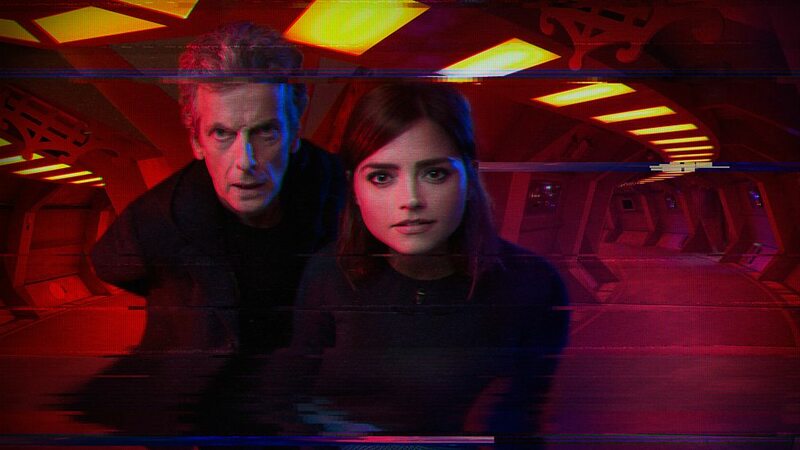 Sleep No More, the ninth story from Series 9, finds the Doctor and Clara faced with a dark mystery, where the events now unfold in the frightening footage discovered from the deep space rescue mission. This chilling adventure written by Mark Gatiss (The writer of many Doctor Who episodes, including The Unquiet Dead (2005), the Idiot’s Lantern (2006), Victory of the Daleks (2010), as well as two episodes from 2013’s seventh season, Cold War and The Crimson Horror, and Robot of Sherwood (2014) from series eight), brings us a suspenseful found-footage tale, directed by Justin Molotnikov (Da Vinci’s Demons / Atlantis / Merlin). The recorded events from the Le Verrier Space Station orbiting Neptune holds details of a terrifying story after the data is assembled. But once it has been watched you can never unsee it! 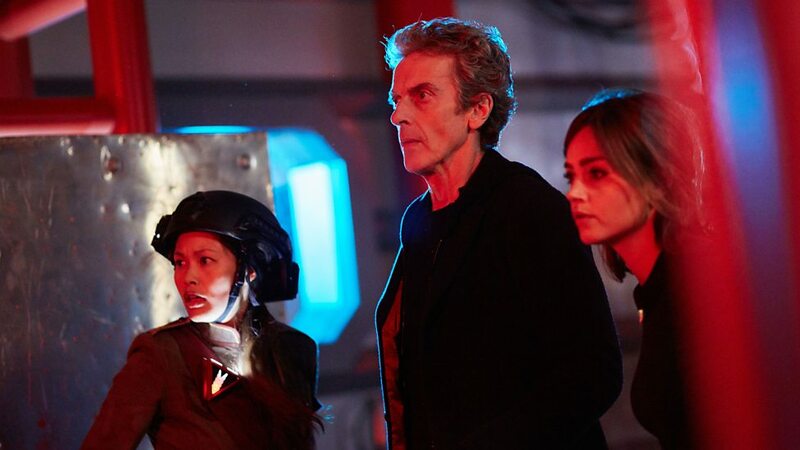 Its been about 24 hours since the station went silent, a team from Triton led by Nagata (Elaine Tan) has been sent to investigate, but when the Doctor (Peter Capaldi) and Clara (Jenna Coleman) also get caught up in events they must work together to figure out what happened to the crew on board the orbiting laboratory. After encountering frightening creatures made of sand they gets separated from Deep-Ando, the Doctor, Clara, and the rest of the team find shelter, where Clara becomes trapped briefly inside one of the Morpheus pods before the Doctor rescues her. It seems the Morpheus machine invented by Professor Rassumussen (Reece Shearsmith), pod-like devices that concentrate nocturnal experiences to enable humanoids to go a whole month without sleep, has the potential to revolutionise the labour force of humanity – but with dire consequences! The Doctor confronts Rassumussen after he’s found hiding in one of the Morpheus pods, his machine might have conquered nature, but in doing so the Professor has also created nightmarish abominations, the Sandmen, and the creatures seem almost unstoppable! 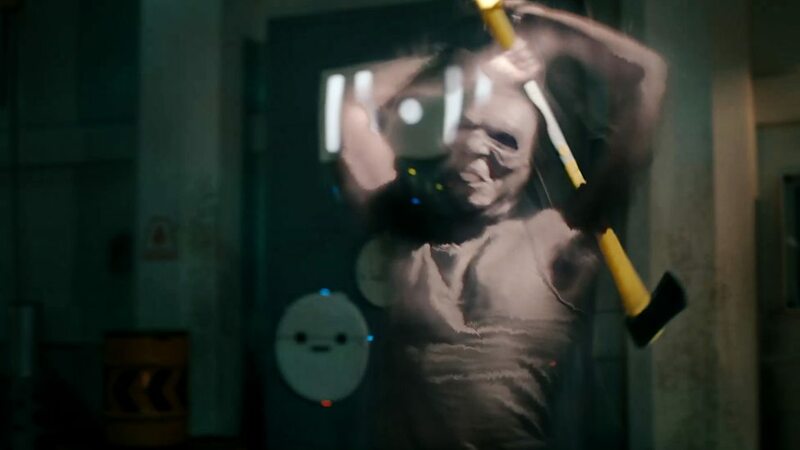 Mark Gatiss exploit’s the “found footage” horror format to the full in Sleep No More, in an episode boasting shocks and scares around every shadowy corner, a sinister take on the 50’s pop song Mr Sandman, and the hideously misshapen Sandmen monsters, this is undoubtedly one of series nines darkest episodes so far. 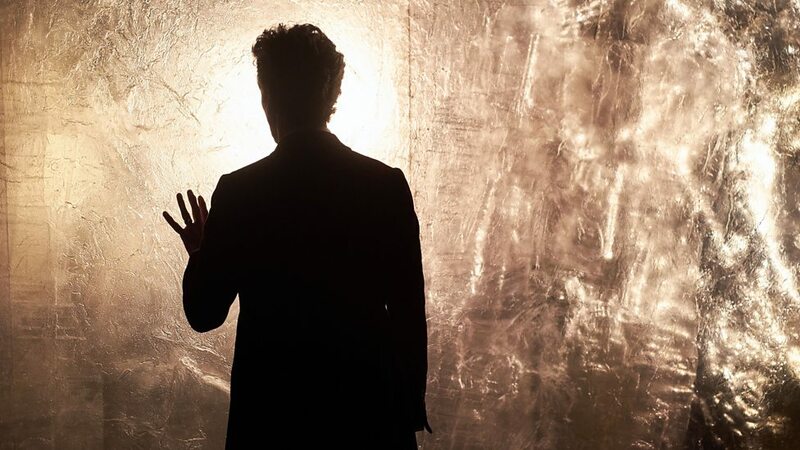 As well as strong performances from Peter Capaldi and Jenna Coelman, Sleep No More also breaks new ground by not having any conventional title sequence (Although some text and letters do flash across the screen early on that momentarily spell the words Doctor Who) whatsoever – a first for Doctor Who – and director Justin Molotnikov uses spooky camerawork and eerily unsettling sounds to great effect over the course of this fabulously tense, atmospheric, and creepy episode. 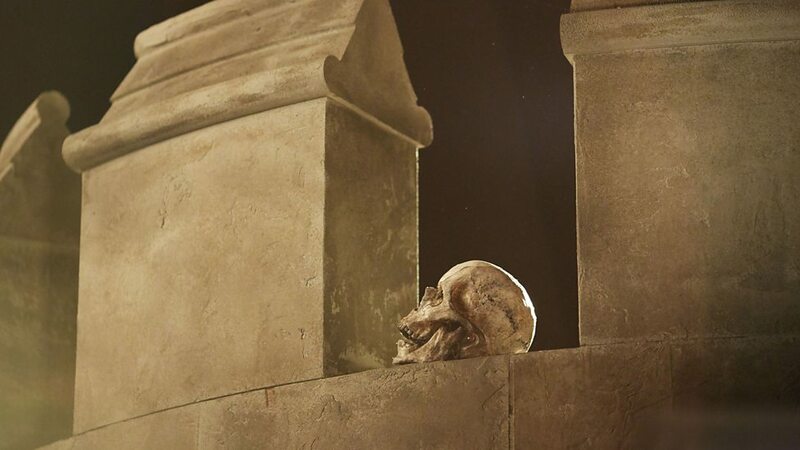 The way the action in this episode is intercut with Rassumussen’s narration to camera is handled well, there are lots of creepy deaths when the Sandmen attack, the sequence where the gravity shields initially fail is also really exciting, and the scenes where the Doctor, Clara, and Commander Nagata hide in the cold store from the Sandmen are especially nerve wracking – especially when the Doctor realises the Sandmen are blind as he leads the escape from the freezer. Rassumussen is played by Mark Gatiss’ League of Gentlemen pal, Reece Shearsmith, who is excellent in his role as the ambitiously foolish scientist, and there is far more to Rassmussen’s story than meets the eye… Although this is his first appearance in a Doctor Who episode, Reece Shearsmith did play the role of the 2nd Doctor briefly for the 2013 drama about the programmes origins, An Adventure in Space and Time, which was also written by Mark Gatiss. Sleep No More features a great mix of characters, including Nagata (Elaine Tan), Chopra (Neet Mohan), the clone 477 (Bethany Black), Deep Ando (Paul Courtenary Hyu), the Morpheus Presenter (Zina Badran), and Natasha Patel, Elizabeth Chong, Nikkita Chadha, and Gracie La as the group of hologram singers. Having also played a Zygon in The Zygon Invasion & The Zygon Inversion in Series 9, Tom Wilton returns again, this time making an appearance as one of the Sandmen. It is a time of great prosperity for the galaxy, the Morpheus machine has made sleep virtually obsolete, thus increasing productivity. Time is money after all! Rassumussen has effectively changed the nature of human existence, but the true cost of his experiments with the latest model of his Morpheus machines on the Le Verrier Space Station are quickly becoming apparent. With the help of the sonic specs the Doctor is eventually able to discern a frightening connection between the sleep dust in the atmosphere and the how the footage is being relayed, it makes what actually happened to the crew of the station seem even more horrible, as those using the Morpheus machines, even for a short time, become infected and consumed from the inside, but the Doctor is confident he can reverse the process in Clara and Nagata once they reach the TARDIS. The creepy new monsters “The Sandmen” are great hulking creatures, terrifyingly powerful, and they seem virtually unstoppable. Essentially they are life forms created from the sentient acumination of human sleep dust, a side effect of using the Morpheus machines on the station. The Sandmen consumed their human hosts who were using the pods, before hunting down the rest of the crew, and then later the rescue team from Triton. The creatures are immensely strong, but they are also blind, and deactivating the stations gravity shielding can severely affect the cohesion of their bodies. Indeed, with their grotesque form and horrific nature, the Sandmen are a powerful reminder of the sleep that all humans need to save them from the monsters lurking inside. 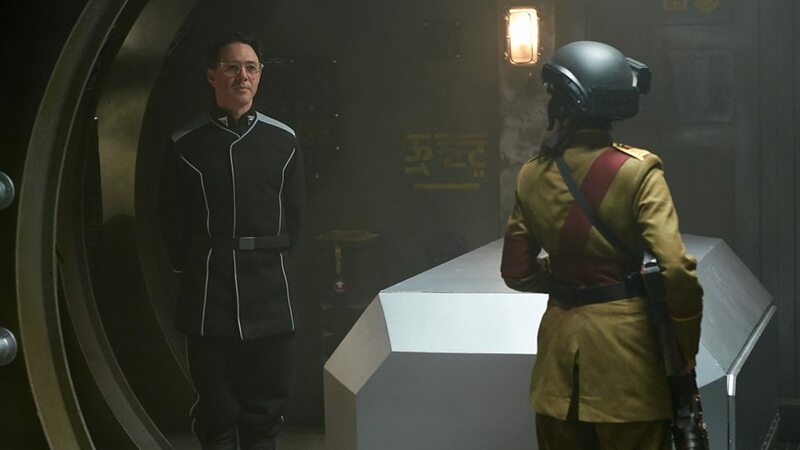 Mark Gatiss has entwined a number of references from past Doctor Who stories into Sleep No More, Nagata mention of the Space Prates, in a clear not to the 1969 Doctor Who story The Space Pirates, the 12th Doctor also speaks of the great catastrophe which loosely alludes to Frontios (1984), when Clara names the creatures in Sleep No More as Sandmen, which the Doctor initially contests, it alludes to a similar issue where the Doctor didn’t name the Earth-based reptile species in The Silurians (1970), and their name – presumably it was a human that named them as Silurians – turned out to be somewhat misleading and technically inaccurate. There are links to Greek mythology, specifically Morpheus god of dreams, and some key lines of dialogue from Shakespeare’s Macbeth. Sleep No More uses all the familiar tropes of the “found footage” genre, Mark Gatiss has crafted a highly disturbing concept for this story, and there are moments that genuinely scary. 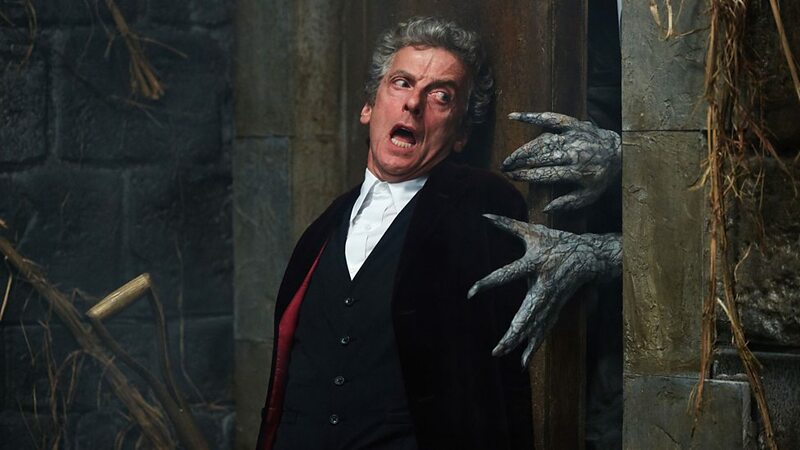 Peter Capaldi and Jenna Coleman are on excellent form, Reece Shearsmith is great as Rassmussen, and the supporting cast – especially Elaine Tan as Nagata, all get a good share of the spooky action. Director Justin Molotnikov builds the brooding menace throughout, and there are plenty of surprises to keep you guessing about what will happen next. 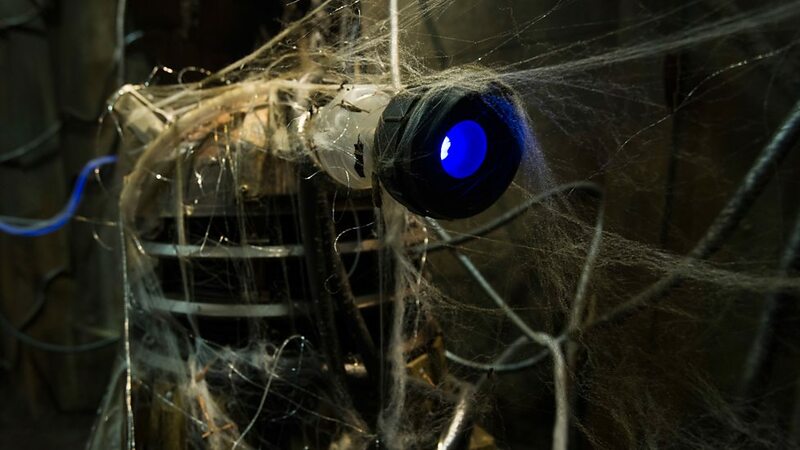 While I’m not a big fan of found footage films, I found Sleep No More to be a bold experiment with the format of Doctor Who, and one that actually proved to be a lot more successful than I was expecting it to be. Here’s a Doctor Who Series 9 Extra where Mark Gatiss, Steven Moffat and the cast discuss creepy new monsters, The Sandmen! 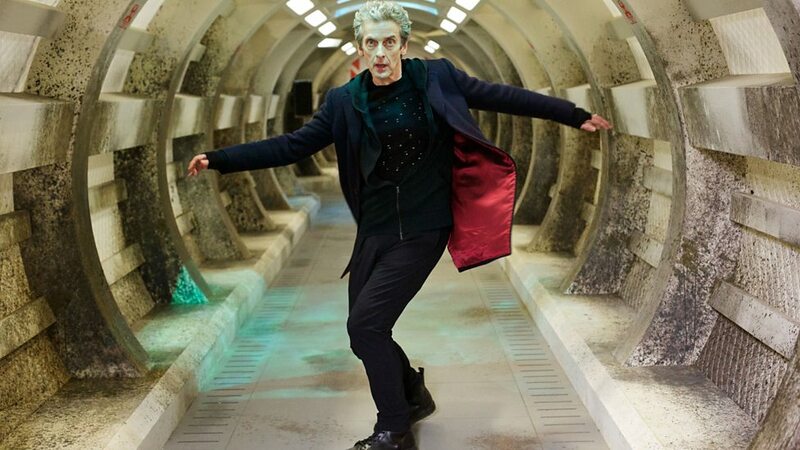 The Zygon Inversion concludes this exciting two-part story from Series 9, written by Peter Harness (Kill The Moon) and Doctor Who show runner Steven Moffat, and directed by Daniel Netteim (Line of Duty / Humans), finds the Doctor, Clara, Kate Stewart, Osgood, and UNIT all in peril as the Zygon revolution begins in earnest. The Zygon Inversion brilliantly resolves the cliff-hanger from The Zygon Invasion, where Clara’s Zygon double, Bonnie, fired a rocket launcher at the Presidential Aircraft just as the Doctor and Osgood where returning to the UK from Turmezistan. An ingenious plot twist wrong foots us right from the outset, using Clara’s unsettling experience as a “live feed” for her Zygon double to provide us with an entirely different perspective of the events leading up to the cliff-hanger. Following their mid-air escape, the Doctor (whose parachute is remarkably patriotic!) and Osgood (the Zygon “sister” of the human Osgood murdered by Missy in the 2014 series finale Death In Heaven) become fugitives as Bonnie searches the UNIT safe house for the location of the Osgood Box. 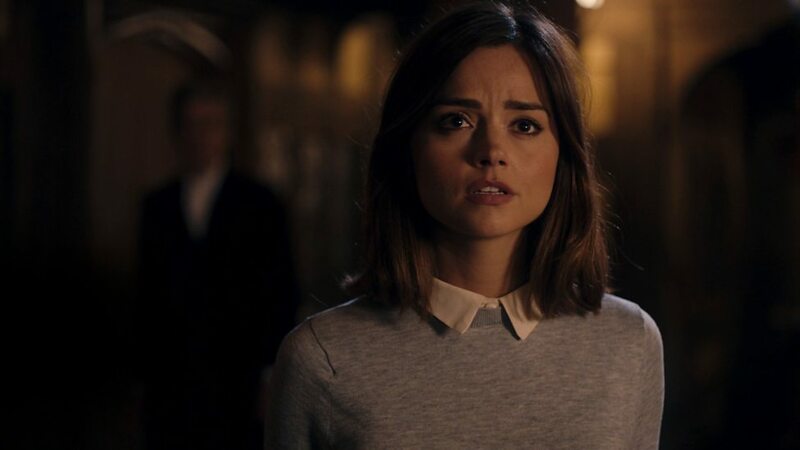 But when the Doctor receives a surprise text message, Osgood realises the real Clara is “awake”, and the subsequent phone conversation between Dr John Disco and Zygella allows Clara to use a non verbal form of communication to tell the Doctor she’s trapped amongst the Zygon pods in the tunnels beneath the streets of London – where the missing civilians are also being held. 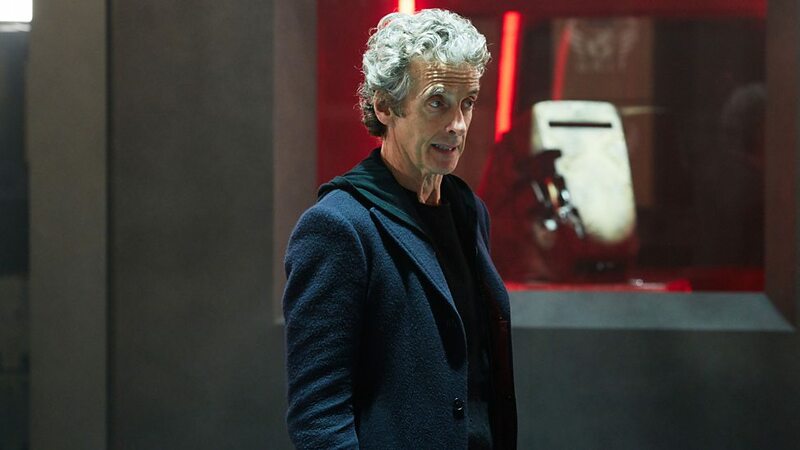 The Doctor and Osgood make a fantastic team in The Zygon Inversion, brilliantly played by Peter Capaldi and Ingrid Oliver, these characters work so well together. 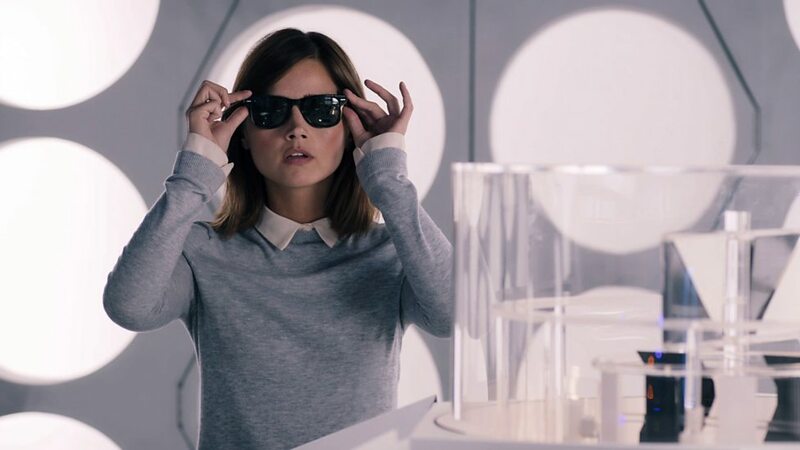 The chemistry between them is magical and their banter is sure to bring a wry smile to your face, especially when Osgood gets to wear the Sonic Specs after her own glasses were broken, and it soon become clear that Osgood is undoubtedly a big fan of the Doctor! Kate Stewart also has a key role to play in events in this episode, her character has some fantastic scenes, and Jemma Redgrave gives a strong performance as Kate Stewart faces the most challenging decision of all. 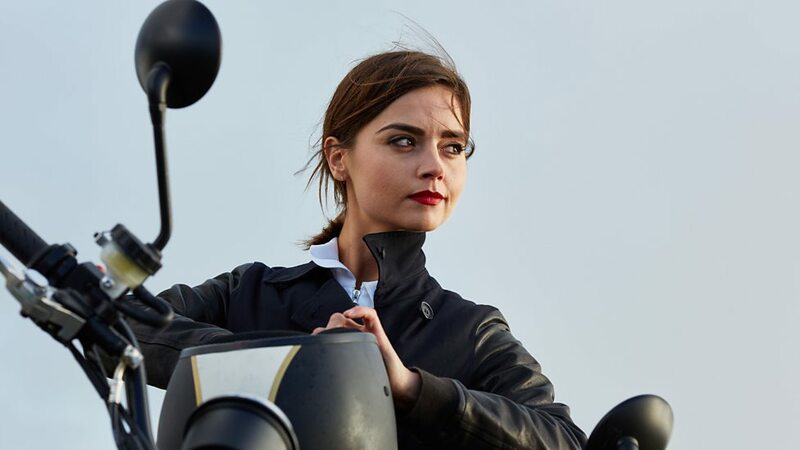 Jenna Coleman is also fabulous in her roles as both the real Clara Oswald and her villainous Zygon / human duplicate Bonnie. She gets some great scenes when Clara’s consciousness is in the bizarre dream-like reality of her flat while her body is trapped inside the Zygon pod, particularly when Clara has to find a way to endure Bonnie’s interrogation about the Osgood Box to stay alive, and Coleman is also wickedly evil as Bonnie in her quest to use the Osgood Box to end the ceasefire – no matter what the price of victory. 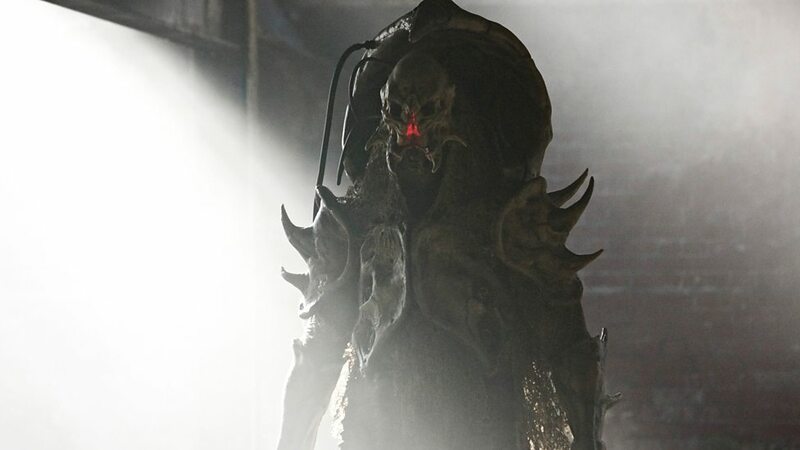 Ever since the Zygons first appeared in the 4th Doctor story Terror of the Zygons (1975), they have been amongst the series’ most popular monsters, and their long awaited return in The Day of the Doctor (2013) led to the fragile peace between Zygons and Humans that is now under threat in The Zygon Inversion. The Zygon Invasion and The Zygon Inversion has made the new Zygons (Played by Aidan Cook, Tom Wilton, and Jack Parker and brilliantly voiced by Nicholas Briggs) even more menacing than ever before, and the Zygon transformation in The Zygon Inversion are especially graphic. Their shape-changing abilities no longer require the original body print to refresh the Zygons disguise, they can even adopt the form of your nearest and dearest directly from your mind to use against you, and their hands can emit a lethal electric sting. 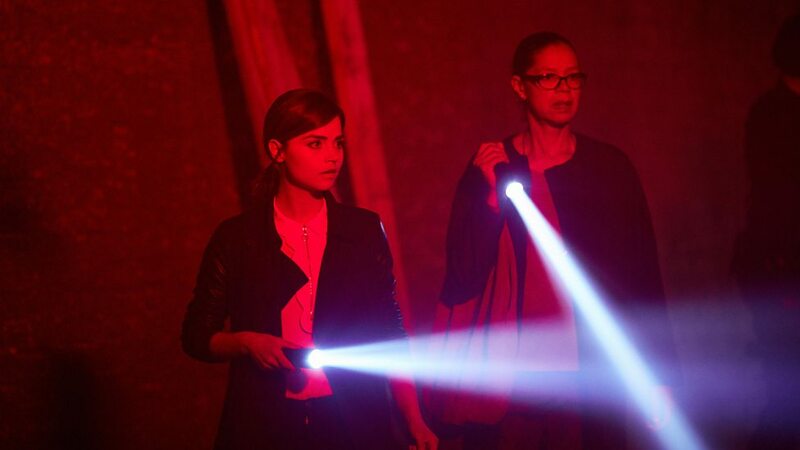 However, as we see with Clara and Bonnie in this episode, Zygon live links can work both ways and be used against them. The differences between Zygons who want to live in peace on Earth and the splinter Zygon faction from the younger brood that wants to conquer the world are thrown into sharp contrast in The Zygon Inversion, just as Kate’s views and Bonnie’s stance on the Zygon revolution are also called into question, and the powerful script by Peter Harness and Steven Moffat unflinchingly tackles these challenging issues. 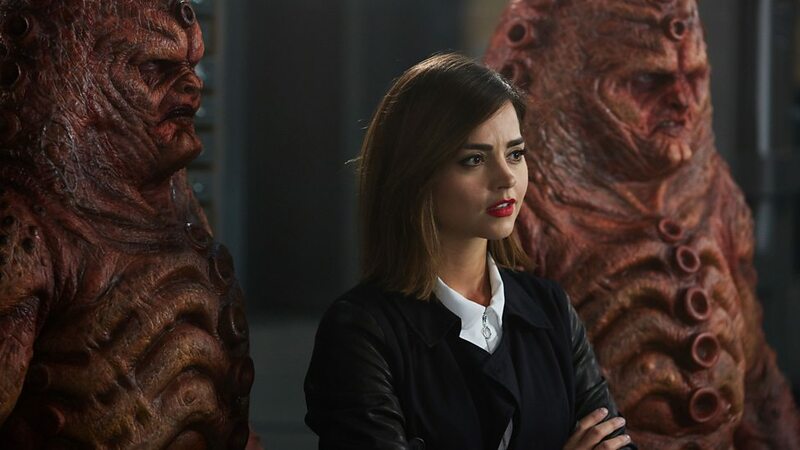 The Zygon Inversion builds towards an exciting finale, as the Doctor, Osgood, Kate, and Clara, find themselves locked in a tense stand-off against Bonnie and the Zygons in the Black Archive, where the mystery of the Osgood Box – which the Doctor left on Earth as the final sanction should the Nightmare Scenario occur – and the reason why both the Zygon and Human Osgood’s were needed is finally revealed at last. It sets in motion a deadly game of truth or consequences. 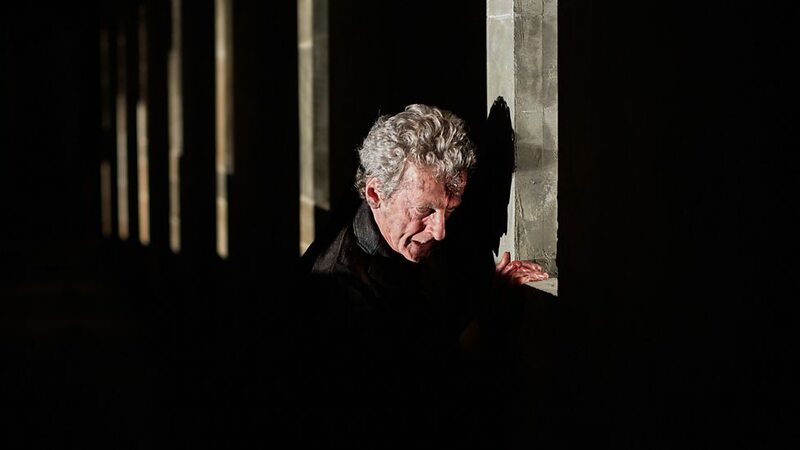 Peter Capaldi’s powerful speech here, to break the cycle and broker peace once more between Zygons and Humans, is sure to be heralded one of this series’ defining moments, it’s a truly momentous scene, and Peter Capaldi’s performance is utterly magnificent! There are a number of nostalgic references in The Zygon Inversion. The 1st Doctor’s (William Hartnell) portrait is seen again in the UNIT safe house, and we also get another mention of the Z67 Sullivan Gas – a clear link to the 4th Doctor’s (Tom Baker) companion Naval Surgeon Harry Sullivan (played by Ian Marter). Kate Stewart also gets to use the line “Five rounds rapid!”, a line forever associated with Kate’s father, Brigadier Lethbridge-Stewart (Nicholas Courtney) in the classic 3rd Doctor story The Daemons (1971). The Doctor also reflects on a time when he was going to press a button in another box, The Moment, during the Time War in The Day of the Doctor. UNIT’s Black Archive also returns, the secret facility played a major role in that story, and eagle eyed viewers will also spot a Mire helmet from The Girl Who Died in the background. The Doctor is also surprised when Osgood admits she doesn’t know what TARDIS stands for as she’s heard there are a couple of different versions of this anachronism. The “D” has been referred to as both “dimension” and “dimensions” at different points in both the classic series and the new series, in An Unearthly Child (1963) the Doctor’s granddaughter, Susan (Carol Ann Ford), claimed she’s made up the name “time and relative dimension in space”, but the Doctor would later go on to tell people the “D” stands for dimensions, when the series returned in 2005 the 9th Doctor (Christopher Eccleston) explained the name of the TARDIS to Rose (Billie Piper) in her debut adventure but reverted back to “time and relative dimension in space”, and the 12th Doctor’s ridiculously OTT explanation to Osgood in The Zygon Inversion about what TARDIS really stands for is a fun acknowledgment of Doctor Who’s most unusual quirk in continuity. With peace finally declared, along with a somewhat convenient mind-wiping re-set switch to restore the post Day of the Doctor status quo between the Zygons and Humans, the wonderful closing scenes with Osgood await us, and what marvellously scripted scenes they are. There are so many fan-pleasing moments in the conclusion of The Zygon Inversion its sure to leave you seeing double, Osgood’s outfit here also takes several elements from seventh Doctor’s (Sylvester McCoy) costume from The Curse of Fenric (1989), and I’m sure that I probably wont be the only one hoping Osgood accepts the Doctor’s offer to travel in the TARDIS one day. Some questions are left unanswered for now, there’s a fun play on first names, and a poignant closing TARDIS interior scene that beautifully judges emotion and time as one and the same. 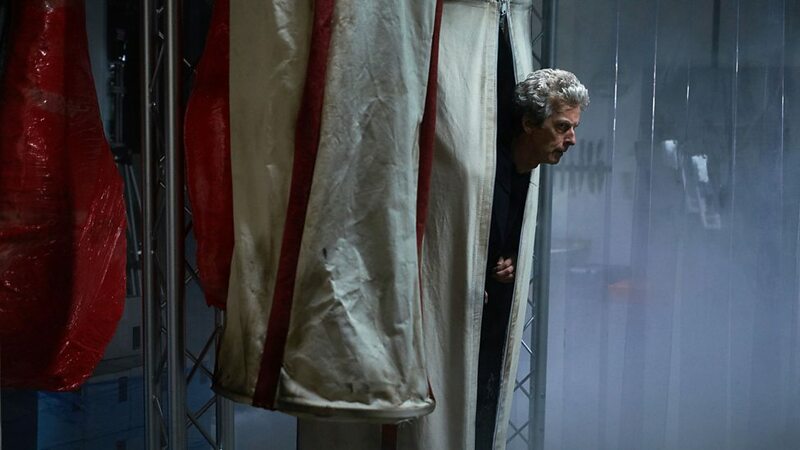 Proving itself to be anything but the same old same old, The Zygon Inversion is Doctor Who at its very best, and this episode provides an exciting and tense conclusion to this two-part story. 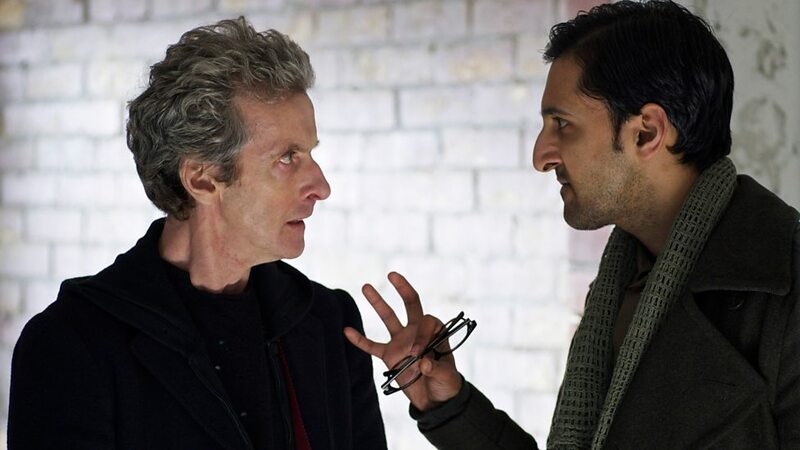 The taut script by Peter Harness and Steven Moffat skilfully plays on the issues of identity, trust, and paranoia, while the stories deep philosophical core enables director Daniel Netteim to gradually build this though-provoking episode to a thrilling conclusion. 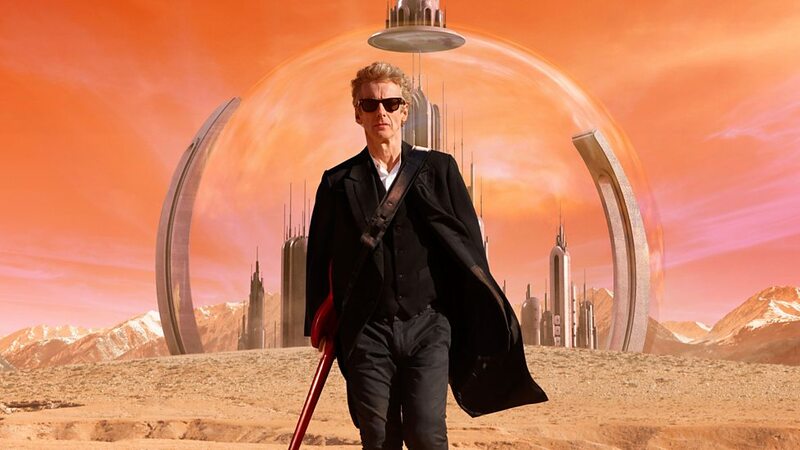 With its strong cast, excellent performances from Peter Capaldi, Ingrid Oliver, Jemma Redgrave, together with Jenna Coleman’s brilliantly acted dual role as Clara and her evil counterpart, and the return of the Zygons for this story, The Zygon Invasion & The Zygon Inversion have all the hallmarks of classic Doctor Who and is without a doubt one of the best two-part stories from Series 9 so far! And just for fun here’s a clip where actress Ingrid Oliver explains why Osgood turns down the chance of a lifetime at the end of The Zygon Inversion! A fragile peace established long ago beneath the Tower of London is in jeopardy. Zygons have been living in peaceful coexistence with humans, undetected, but a rogue faction has begun plotting to overthrow humanity. Joining forces with UNIT to help deal with the global crisis, the Doctor and Clara must stop events spiralling out of control. A message from UNIT scientific officer Osgood issues a chilling warning, but she is supposed to be dead, is this really Osgood, or some Zygon deception? The Doctor, Clara and UNIT must embark on a world-wide adventure to rescue the kidnapped Osgood and stop the Zygon Invasion! The Zygon Invasion, written by Peter Harness, who also scripted Kill The Moon (2014), begins a two-part story that features the return of the classic Doctor Who monsters, the Zygons, which originally appeared forty years ago in the 4th Doctor story Terror of the Zygons (1975). The Zygons also played a significant role in the 50th anniversary story The Day of the Doctor (2013), where Kate Stewart and Osgood from UNIT confronted Zygon duplicates of themselves in the Black Archive below the Tower of London. The Zygon Invasion and The Zygon Inversion, directed by Daniel Nettheim (Line of Duty), returns to address the memory-wiped peace Kate Stewart and Osgood negotiated with their memory-wiped Zygon counterparts, and the challenging issues facing this Zygon-Human coalition when a secret Zygon faction attacks humanity. Right from the opening moments, The Zygon Invasion hit’s the ground running and the action doesn’t let up for a moment. A fan-pleasing recap of event from The Day of the Doctor sublimely blends into a recording made by both Osgoods in the wake of these events, detailing the covert Operation Double instigated by UNIT that allowed sanctuary to the 20 million Zygons now been living on Earth disguised as humans, who until now have existed unnoticed, in peaceful coexistence alongside humanity. As we ponder the mystery of Osgood’s Box the Doctor’s rousing guitar solo in the TARDIS is interrupted by news of the Nightmare Scenario! 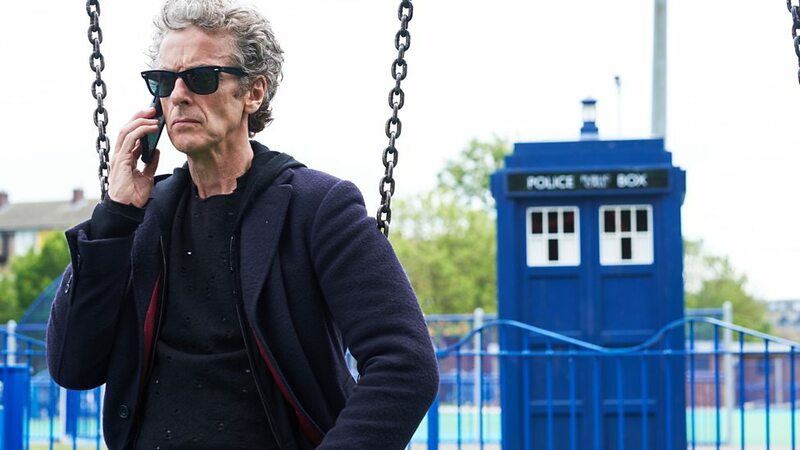 “Doctor Disco” returns to Earth, but a Zygon attack on a children’s playground and sinister happening near Clara’s flat, soon reunites the Doctor and Clara with Kate Stewart, Jac, and UNIT at the former Zygon Base inside the Drakeman Junior School in London, where the Zygon Control Polyp has been compromised, and the Doctor and his allies witness as the Zygon High Command – in the form of the kidnapped school girls Claudette (Cleopatra Dickens) and Jemima (Sasha Dickens) – are ruthlessly usurped by the radicalised splinter group from the younger Zygon brood now seeking to take over the world. 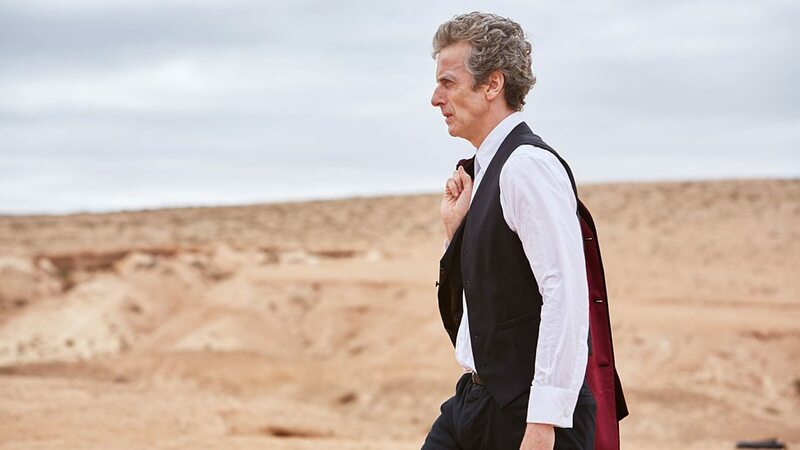 The Doctor and Clara are right at the heart of the action in The Zygon Invasion, Peter Capaldi and Jenna Coleman continue to build on the strong relationship between the Time Lord and his travelling companion. Kate Stewart is also back for this adventure, brilliantly played by Jemma Redgrave; she is joined by Jaye Griffiths as Jac. Jemma Redgrave has some great scenes with Peter Capaldi, especially when Kate and the Doctor are at loggerheads about bombing the Zygons, and Kate also gets to investigate a decidedly spooky town in New Mexico – where Gretchen Egolf proves unsettlingly mysterious as Norlander. 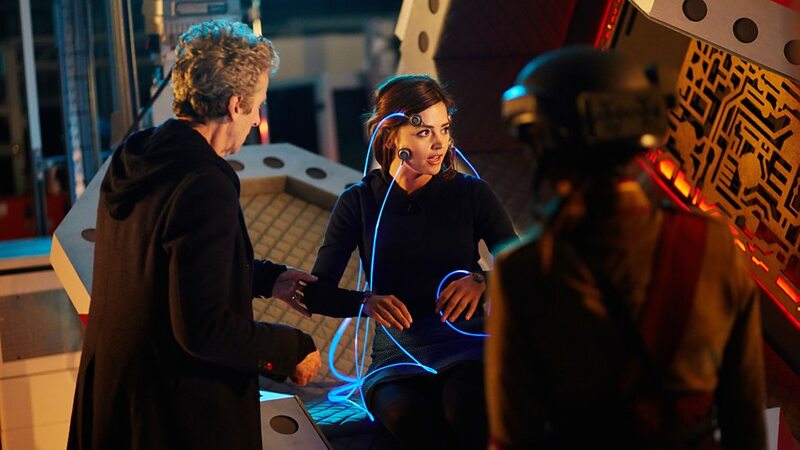 Clara and Jac also make a good team, and they spend much of the episode working together. 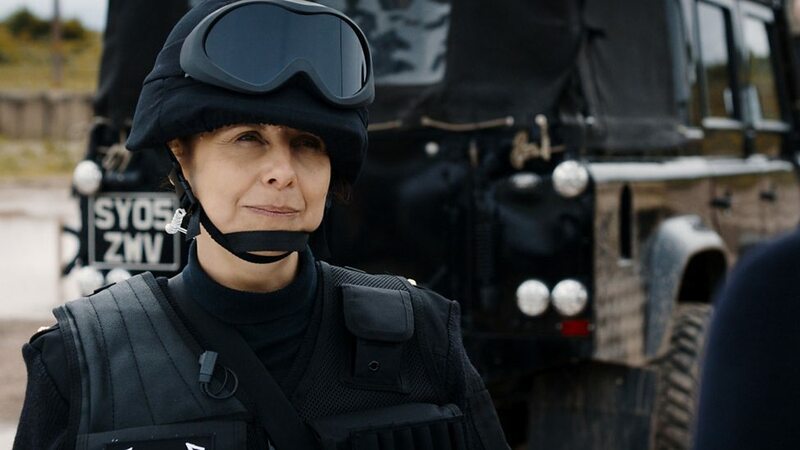 The impressive cast also features Rebecca Front (who also co-starred in The Think of It with Peter Capaldi) as Colonel Walsh, her scenes with Capaldi’s Doctor as her forces confront a difficult situation outside a church in Turmezistan are incredibly tense, and the angst-ridden situations UNIT troops Drone Operator Lisa (Jill Winternitz) and Hitchley (Todd Kramer) face delivers some of the most powerful and moving moments in the entire episode. 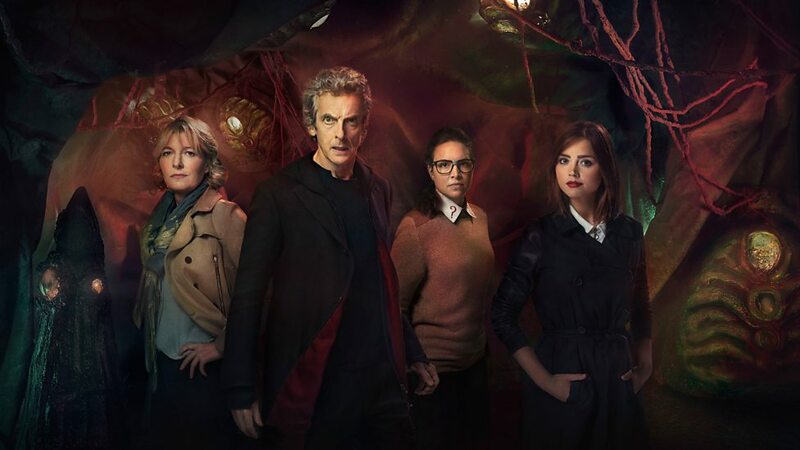 The presumed dead, not dead-is-she-really-a-Zygon now, scientist Osgood also returns in The Zygon Invasion, and it’s great to see Ingrid Oliver back as the former bow-tie / scarf wearing Osgood. Ever since the character first appeared alongside the 11th Doctor in The Day of the Doctor, Osgood soon became a fan-favourite, and her untimely death in the 2014 series finale Death in Heaven – when she was cruelly vaporised by Missy – left us all mourning the loss of our favourite geek / scientist character. Now Ingrid Oliver reprises her role as Osgood in The Zygon Invasion, but is she human this time, or a Zygon disguised as Osgood? Well, this Osgood is indeed the Zygon Osgood, although in many way’s she’s also the human Osgood – as we discover after the Doctor rescues her in Turmezistan. 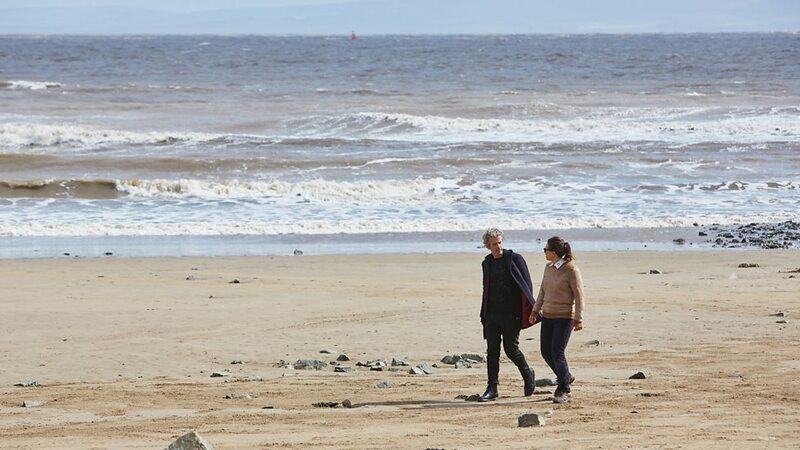 Ingrid Oliver’s scenes with Peter Capaldi are the big highlight of this episode, especially when the Doctor and Osgood travel on the Presidential Aircraft back to the UK, and their movingly frank conversation is undoubtedly one of Series 9’s finest moments so far. The live link the human Osgood and the Zygon Osgood shared makes the Zygon Osgood a hybrid, Human and Zygon at the same time, and she was almost overwrought with grief when her human “sister” was killed as they were the living embodiment of the peace they made between Zygon and Humanity. 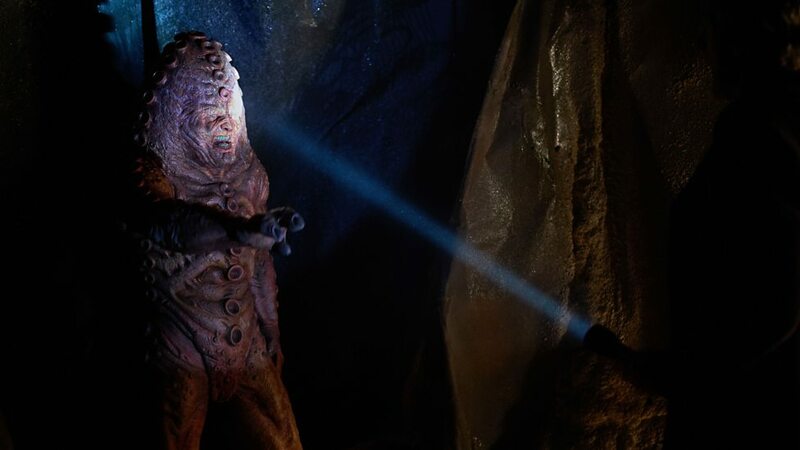 The Zygons have always been a popular monster amongst Doctor Who fans, despite having only appeared in one story during the classic series: Terror of the Zygons – where the Zygons wreaked havoc with their pet Loc Ness Monster (A huge cyborg creature called the Skarasen). 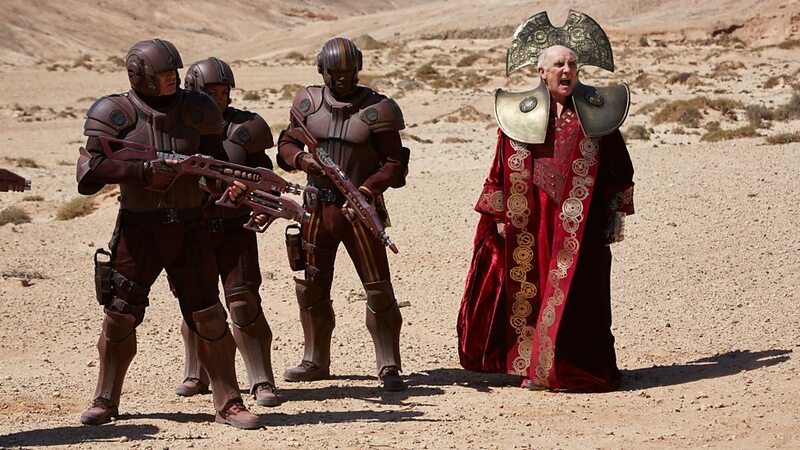 Their return in The Day of the Doctor was a little overshadowed by all the epic events in that 50th anniversary story. 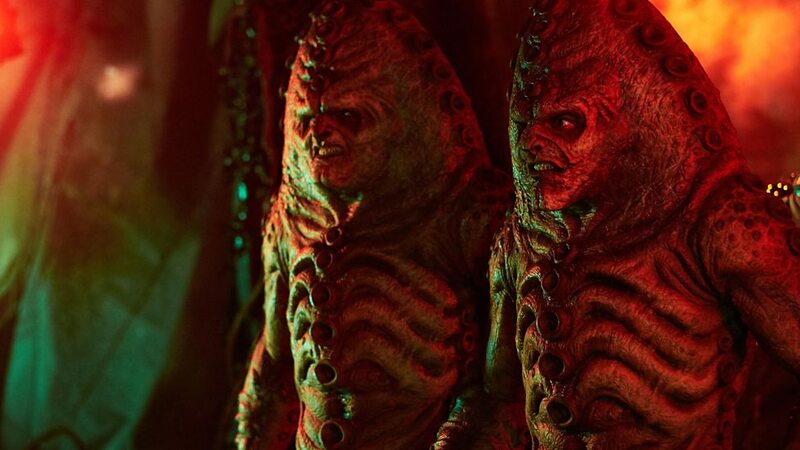 The Zygon Invasion and The Zygon Inversion finally gives the new revamped Zygons a story that really utilizes them and their abilities to the full. Seeing the Zygons (Aidan Cook & Tom Wilton) attacking humans in such everyday settings as they do here is actually quite unsettling. Their shape-shifting powers are used to great effect in The Zygon Invasion, the new Zygon costumes look more menacing than ever, and they secretly plot in caverns below London were strange pods are growing that hide a terrible secret. The Zygons are chillingly voiced by Nicholas Briggs, and he nails their whispering gurgling voice perfectly. It seems the Zygons have evolved too! 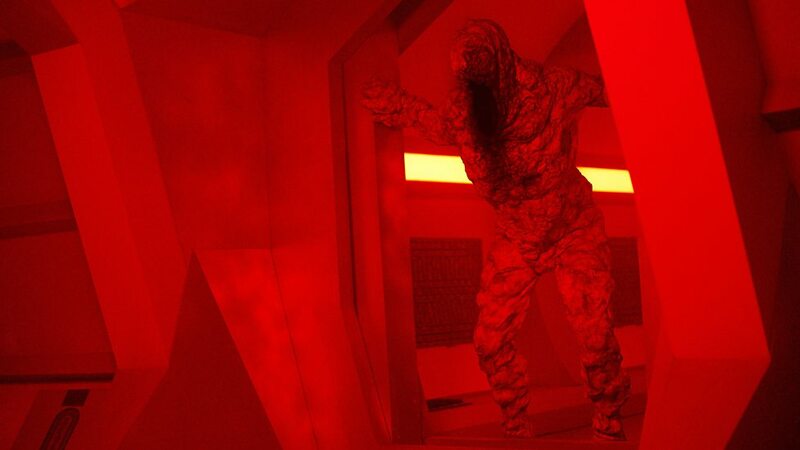 The original body print is no longer necessary for the Zygon to maintain its disguise, once they have the information they need, the original can die, they can even take the images of loved ones from your mind and use them against you, and they have a sting-like bio-electric charge which they use to disable or vaporise their enemies. 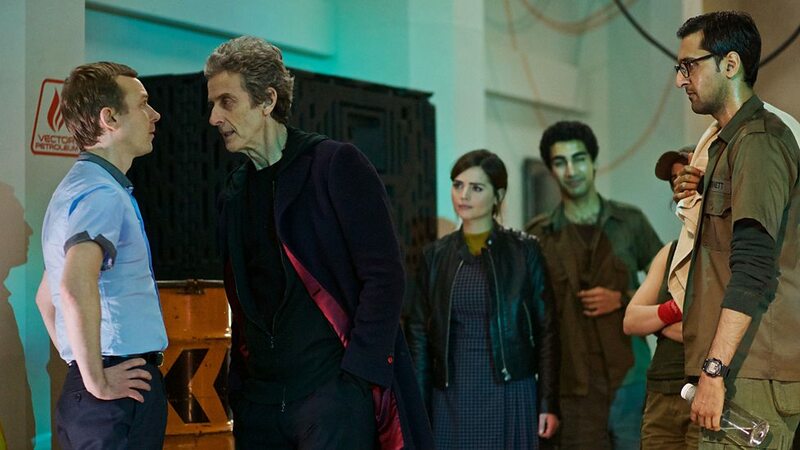 The Zygon Invasion is chock full of continuity references, the opening flashback from The Day of the Doctor features David Tennant, Matt Smith, and John Hurt as the 10th, 11th, and War Doctor respectively, there’s a portrait of the 1st Doctor (William Hartnell) that adorns the hallway in UNIT’s London safe house HQ, and there’s numerous links to the original invasion in Terror of the Zygons that includes a mention for a certain Naval Surgeon (Harry Sullivan played by Ian Marter) as well. 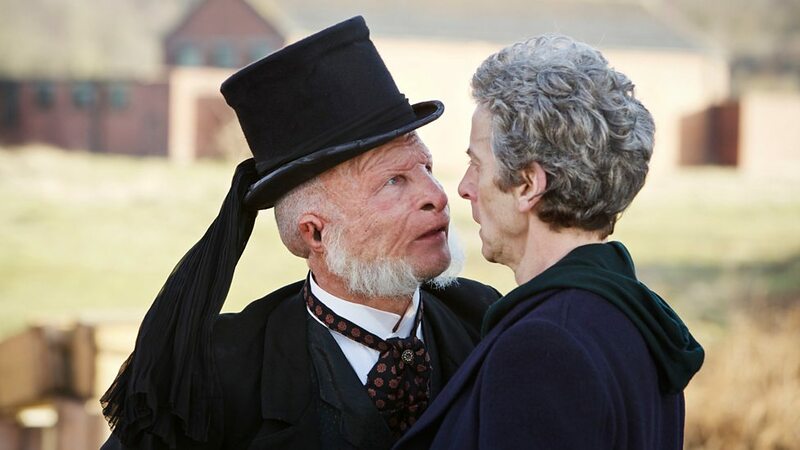 The 12th Doctor recalls kissing Zygon once (the Zygon / Queen Elizabeth the I) from The Day of the Doctor, and the red question marks on Osgood’s shirt lapels where a key feature that also appeared on the shirt collars of the 4th Doctor – from the Leisure Hive (1980) onwards, as well as the 5th and 6th Doctor’s, and the tank top Osgood wears in this episode is not too dissimilar to the one the 7th Doctor wore – although his was covered in rows of the familiar question mark symbols. The Zygon Invasion hurtles towards a thrilling conclusion as the Zygon revolution begins, Kate Stewart makes a horrific discovery in New Mexico, the mystery of what happened to the people who went missing from the lifts and the true contents of the pods in the caves is discovered as treachery strikes, and the Doctor, Osgood, and their Zygon captive on the Presidential Aircraft find themselves locked in the sights of a new enemy… Clara; or more precisely the Zygon duplicate called “Bonnie” who took her place when she went to hep the little boy (played by Abhishek Singh) earlier in the episode! It’s a classic Doctor Who cliff-hanger, with the companion in peril, unconscious in the Zygon Pod in the caves, while her Zygon doppelganger unleashes chaos for UNIT across the world, and Jemma Coleman is fabulous as this wickedly evil version of Clara /Bonnie. Stylishly directed by Daniel Nettheim, The Zygon Invasion certainly gets this new two-part story off to a great start. Peter Capaldi gives a commanding performance as the Doctor in a story that is like an international sci-fi themed conspiracy thriller, the frenetic pace doesn’t let up for a moment, and Peter Harness’ strong script, with its clear nods to Invasion of the Body Snatchers, also tackles some particularly challenging social and political themes with its depiction of the strained relations between the Zygons and Humans in this episode. 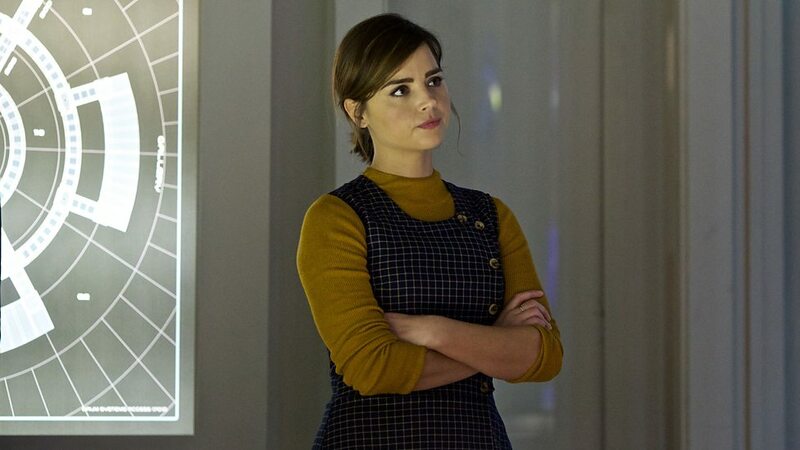 Jenna Coleman is excellent when Clara goes evil as “Bonnie”, its great to see Ingrid Oliver again as Osgood as well, the Zygons also make fearsome adversaries in this exciting story, and the jaw-dropping cliff-hanger brilliantly sets everything up for the truth or consequences to be resolved in The Zygon Inversion. And here’s the Next Time Trailer for The Zygon Inversion! The Woman Who Lived provides an exciting conclusion to the story that began in The Girl Who Died, however this is not your average run-of-the-mill two-part story, and the way it all knits together is ingeniously done. The Woman Who Lived is written by Catherine Tregenna, and she makes her Doctor Who debut here with this episode, having written for theatre plays, Torchwood, and Casualty. 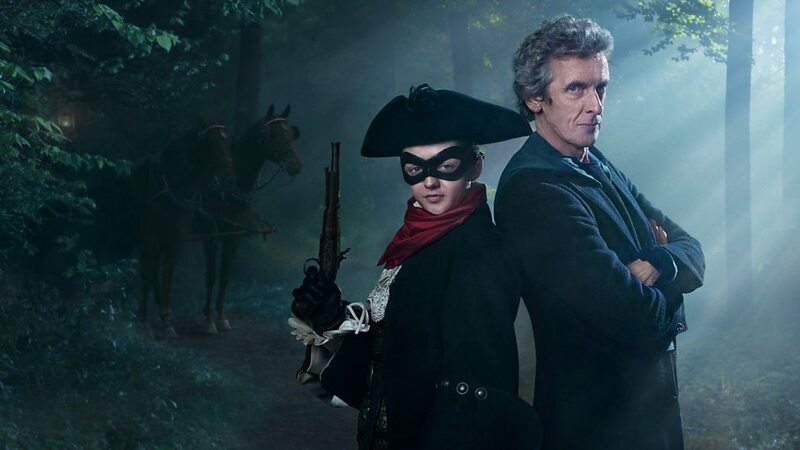 Now, with The Woman Who Lived, this tale by Catherine Tregenna explores the notorious era of the highwaymen, as the Doctor (Peter Capaldi) goes off on an adventure while school teacher Clara (Jenna Coleman) is off taking Year 7 to taekwondo. The Woman Who Lived is also directed by Ed Bazalgette and features the second appearance of guest star Maisie Williams (The actress who plays Arya Stark in the HBO series Game of Thrones) in Series 9 as Ashildr – the Viking girl who gained immortality when the Doctor used The Mire medical repair kit implant to save her in The Girl Who Died. Stand and deliver! Arriving in England, in the year 1651, the Doctor begins his search for an alien artefact but he soon runs into trouble when he interrupts the notorious highwayman, known as The Knightmare, holding up a carriage in the dead of night. 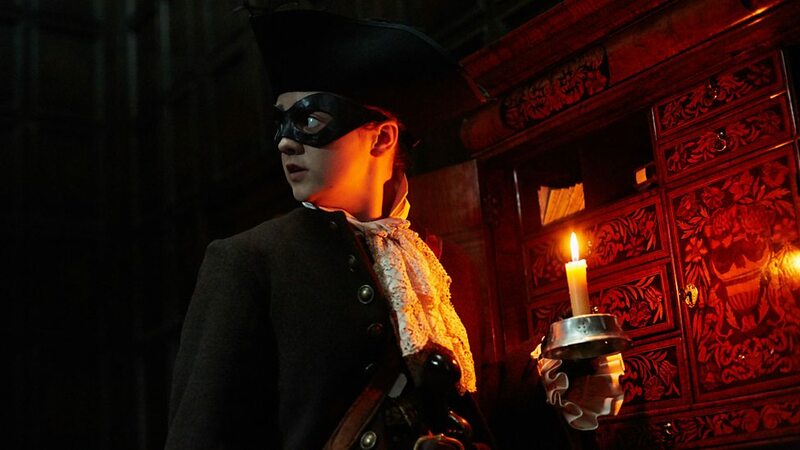 But the Knightmare is no ordinary robber, this is Ashildr! “What took you so long old man..?” Suddenly that line for the Series 9 trailer is given a whole new perspective as Maisie Williams character makes herself known to the Time Lord. But Ashildr is no longer the person the Doctor once knew, the price of immortality has cost her dearly, and she refuses to even acknowledge the name of Ashildr anymore – as everyone she’s ever known or loved is now long gone… It seems that Ashildr, or “Me” as she insists on being called, has done rather well for herself as a Highwayman, obtaining riches, and even an impressive looking home where a mysterious creature lurks in the grounds. Peter Capaldi is on fine form again, he seems completely settled into the role of the Doctor now, and his performance here is spellbinding. 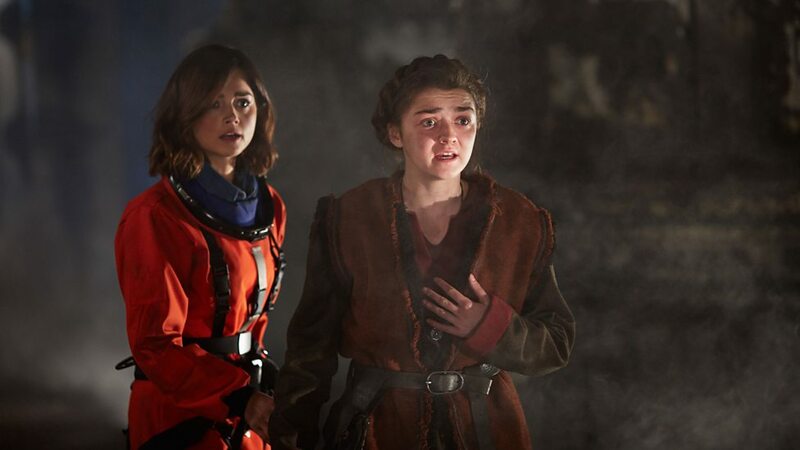 It is a shame that Clara is sidelined for much of this story, but we do have Maisie Williams returning as Ashildr / “Me” to make up for it, as the young Viking girl who acquired immortality, and she proves more than a match for the Doctor as well – even outwitting him at times. Maisie Williams gives a terrific performance in The Woman Who Lived as Me, her character is much darker here, having been deeply affected by her long life of immortality, and even the Doctor is shocked by how dangerous and unpredictable she has become. Me has had 800 years of adventure, we soon explore the events of her immortal life since The Girl Who Died, all the battles, plague, and even the heartbreak of losing her children, and as the Doctor browses though the many journals of her life he finally begins to understand the implications of what he has done. Me wants the Doctor to take her with him, to be free of this life and travel the stars, but how she could possibly know “the man who runs away” has a “ship”? 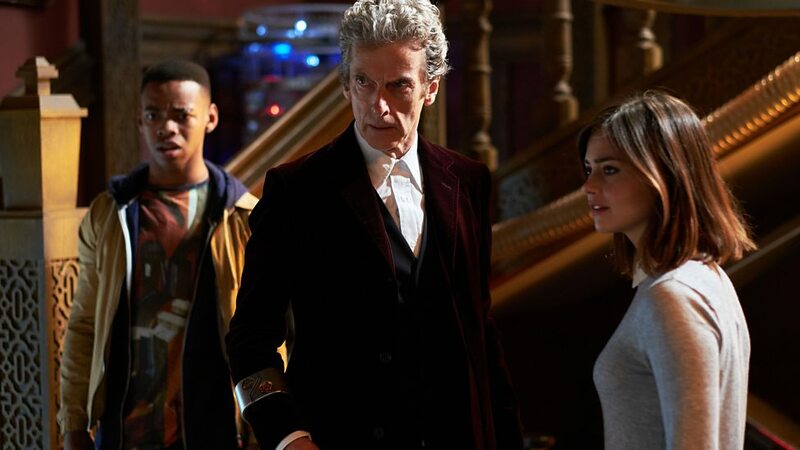 The Doctor’s and Me’s scenes are often a curious mix of witty and moving moments, Peter Capaldi and Maisie Williams make a fantastic team in this action-packed, emotional episode, and their performances magically reinforces the uncanny bond between the Time Lord and the young immortal. After they agree to work together, the Doctor and Me housebreak into the Fanshawe House where the alien artefact – The Eye Of Hades – is held, where the sonic shades serve as the Doctor’s “mask” and Me becomes increasingly exacerbated by her Time Lord “sidekick”, especially when their robbery goes awry and puts them in a tight spot – where Me takes the opportunity to confront the Doctor about how many people he has lost. The Woman Who Lived also has comedian and Doctor Who fan Rufus Hound, as highwayman Sam Swift “The Quick”, who also has a run in with the “Knightmare” and the Doctor, and his scenes with Peter Capaldi and Maisie Williams are brilliantly done – especially when Sam Swift hilariously thinks the Doctor is the Knightmare’s dad / sidekick! Best of all though is when the Doctor stops Me from killing Sam, it’s a menacingly powerful line, one that makes the Time Lords warning absolutely crystal clear, and a great moment for Capaldi’s Doctor. The strange fire breathing creature, Leandro, who wanders the Knightmare’s grounds and home, is played by Ariyon Bakare. This regal looking feline beast claimed to be marooned on Earth and trapped in the 17th Century. 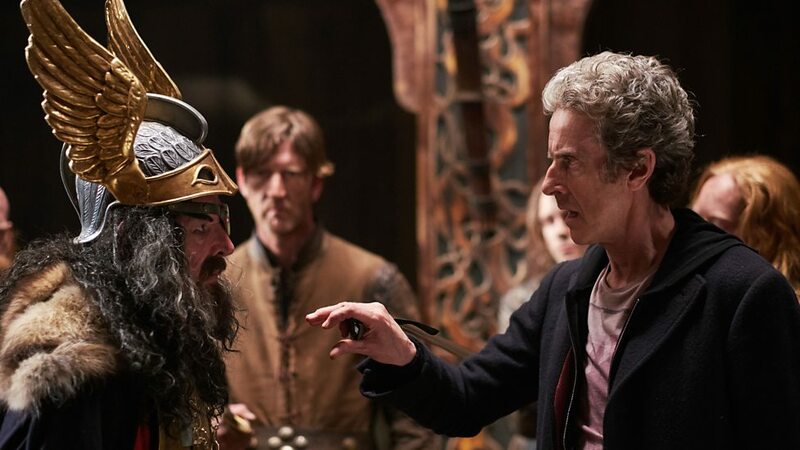 He made an alliance with Lady Me / Ashildr, that once she acquired the missing amulet (The Eye of Hades) for him, they would travel the universe together, but the artefacts presence in 1651 drew the Doctor here and instigated his reunion with Ashildr. 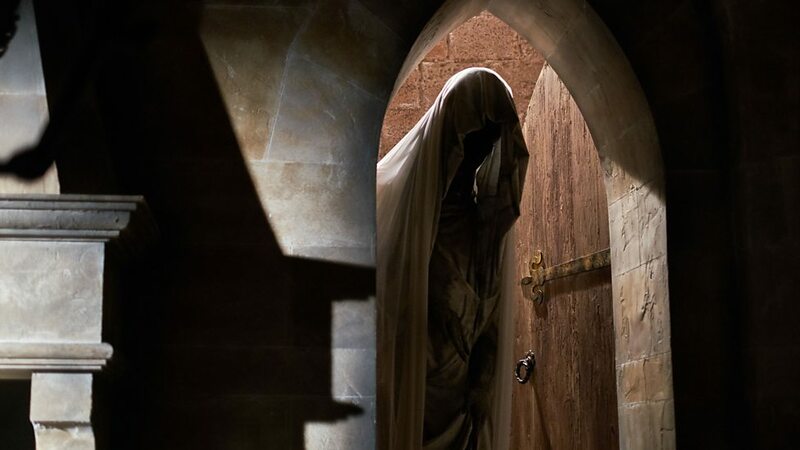 But when the Leonian’s presence is revealed the Doctor is shocked to discover that a life will have to be sacrificed in order to opens this insidious portal to another realm. 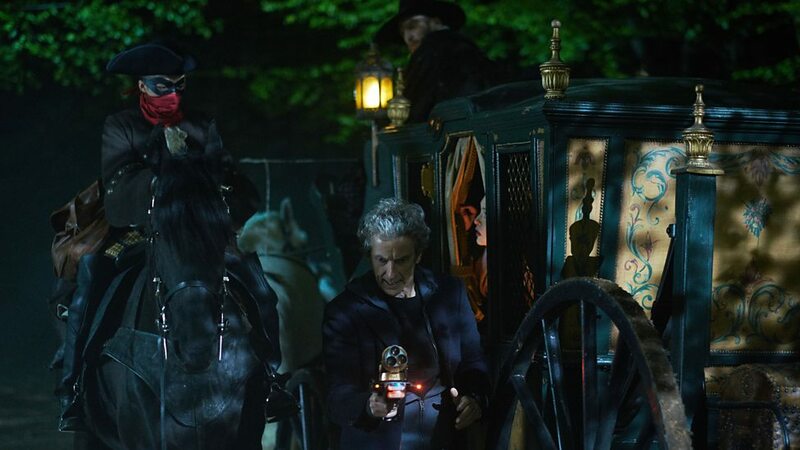 With the Doctor charging to the rescue on horseback, Sam Smith’s impressed there’s been such a good turn out for his hanging, and the gallows humour which follows is gloriously funny – especially when the Doctor joins in. 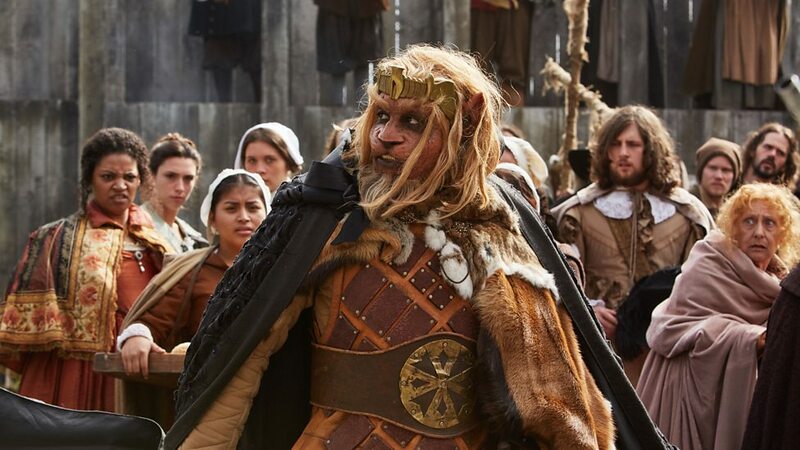 However, when Ashildr uses the amulet to open the portal; it seems Leandro is not the last of the Leonians after all, and an entire Leonian invasion force is waiting on the other side of the portal to invade the world. 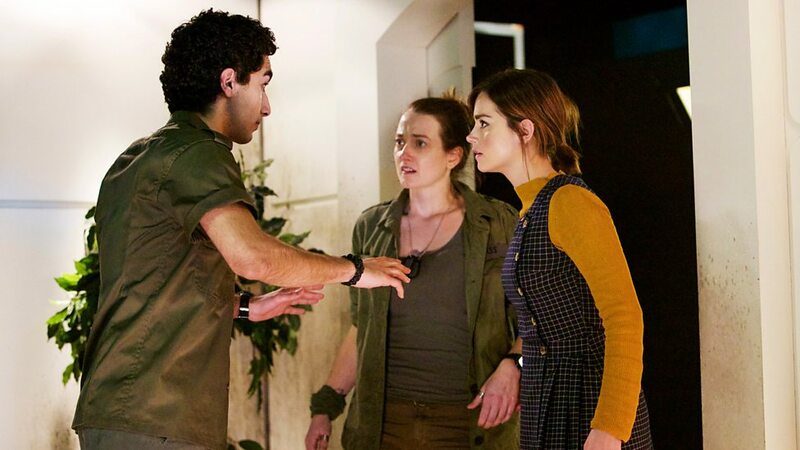 The Doctor’s hope to get Ashildr back on track succeeds, realizing she’s been duped by her Leonian ally, she takes the second medical repair chip the Doctor gave her in The Girl Who Died, and uses it to heal Sam Swift and seal the portal – whereby Leandro’s “brothers” punish him for his failure and vaporise him. While not quite so chock full of continuity references as previous episodes in this season, there are a still one or two interesting things that get mentioned, and the psychic paper also proves quite useful in this story too. When the Doctor tells Me / Ashildr about the Great Fire of London, he mentions that it was caused by the Terileptils, the alien race the 5th Doctor encountered in The Visitation (1982). The Doctor also mentions that he once travelled with another immortal, Captain Jack Harkness (John Barrowman), and the Doctor is sure Captain Jack will probably get around to meeting her eventually. The Girl Who Died is the fifth episode from Doctor Who’s ninth series, written by Jamie Mathieson (The Becoming Human & Being Human writer also penned two popular Series 8 episodes of Doctor Who: Mummy on the Orient Express and Flatline in 2014), and co-written with show runner Steven Moffat. 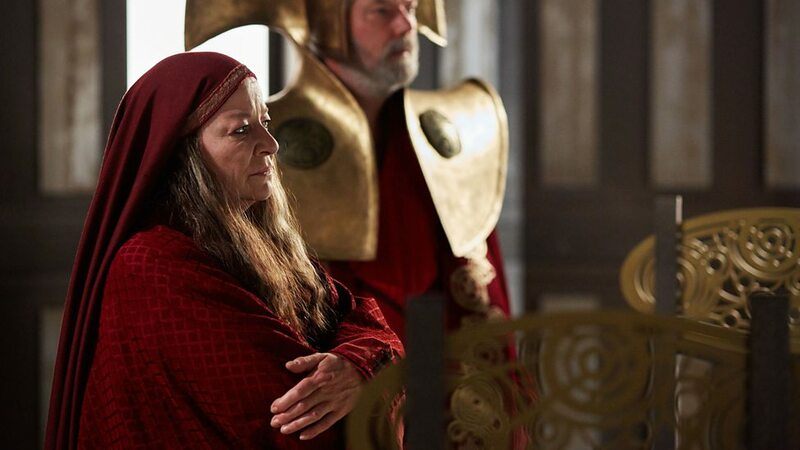 This intriguingly titled episode is directed by Ed Bazalgette, sends the Doctor (Peter Capaldi) and Clara (Jenna Coleman) back in time for the Time Lords first major meeting with the Vikings (The Vikings were also a major part of the First Doctor’s adventure The Time Meddler from Season 2 in 1965), and this series’ eagerly anticipated appearance of Game of Thrones actress Maisie Williams as the Viking tomboy Ashildr. Following a deep space adventure involving battle fleets and something nasty from a Spider Mine, the TARDIS brings the Doctor and the space-suited Clara to a backwater of history, where the sonic shades soon bite the dust – well sort of – and they find themselves captured by Odin-worshiping Vikings and taken to their village. The Doctor attempt to convince them he’s Odin by escaping from his chains and using a yo-yo goes awry when Odin’s face suddenly appears in the clouds overhead! The Mire teleport into the village, scanning their victims, before spiriting away the mightiest warriors to feast with “Odin” in the Halls of Valhalla, but because Ashildr has one half of the sonic shades, its advanced technology and the presence of Clara’s space-suit, ensures she is teleported along with Clara and the Viking warriors to the Mire‘s spaceship. The warriors meet a terrible fate, Clara attempts to confront “Odin” and convince the Mire to leave, but the enraged Ashildr declares war on the invaders, a challenge they eagerly accept before transporting Clara and Ashildr back to the village. 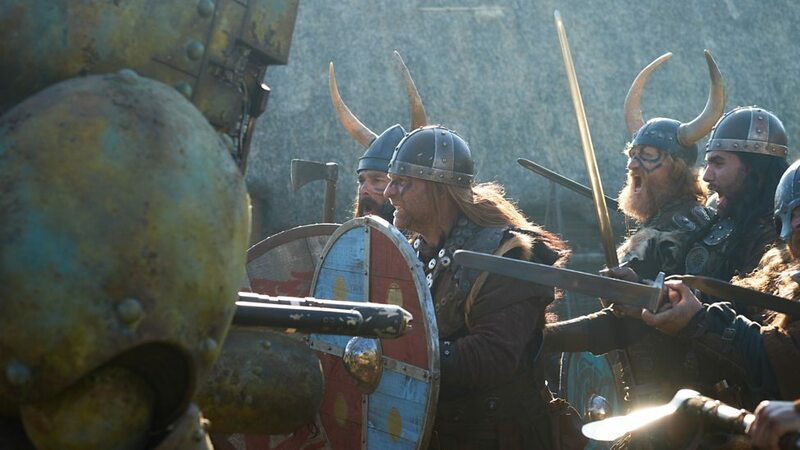 When the villagers refuse to heed the Doctor’s advice and flee, the Doctor and Clara must train this band of farmers, fishermen and blacksmiths to defend their village from the Mire, but with only hours to prepare for the battle, the Vikings are outgunned and outnumbered, and the outcome seems unavoidable. 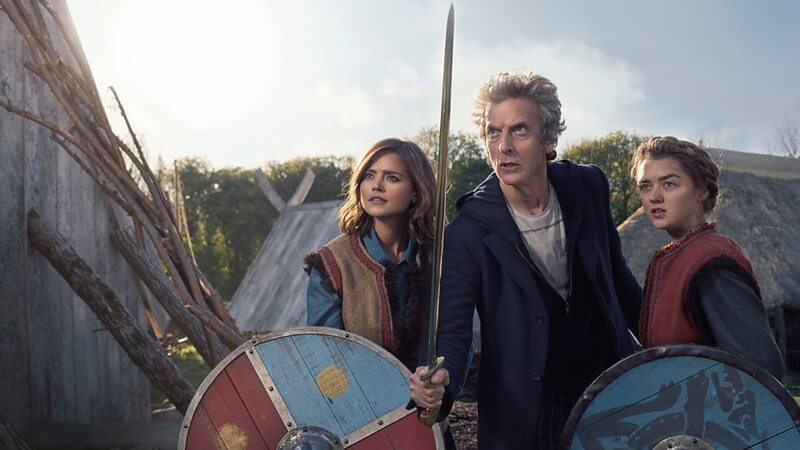 Peter Capaldi and Jenna Coleman continue to shine as the Doctor and Clara, their recent adventures have made the Time Lord and his companion seem even closer than ever, and the banter between them is great fun – especially when they are training the Vikings how to protect their village from the threat of the Mire. The opening scene with a space-suited Clara floating in space is another standout moment. The Girl Who Died also features a very special guest star, Maisie Williams, the actress who plays Arya Stark in the HBO series Game of Thrones. Her role as the Viking girl Ashildr in this episode is central to the plot, and her character has a profound effect on the Doctor. Maisie Williams scenes with Peter Capaldi are absolutely brilliant, especially when she talks about always knowing she was different in some way. 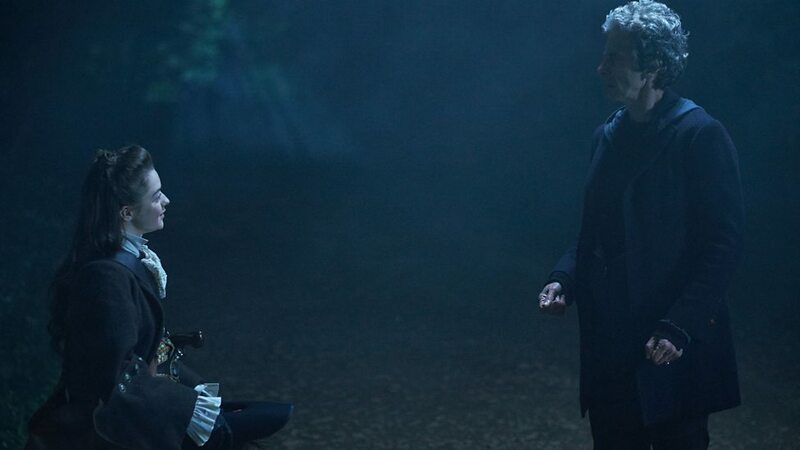 Likewise, the Doctor also returns to his “duty of care” to Calra in this episode, and it provides another brilliant moment for Capaldi and Coleman as Clara urges the Doctor to figure out a plan that will save them all. Jamie Mathieson has crafted a beautifully structured adventure with The Girl Who Died (co-written with Steven Moffat), its like a mash-up of The Magnificent Seven and Vikings, and it possesses many of the qualities that made Mathieson’s previous episodes so popular. 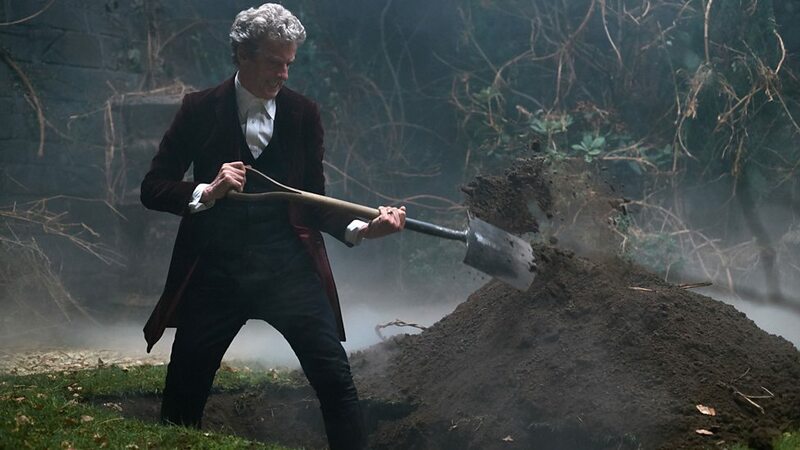 The story is markedly lighter in tone from the early episodes of Series 9, at least initially, but the mood darkens significantly towards the end, and it leaves us with plenty to dwell over. 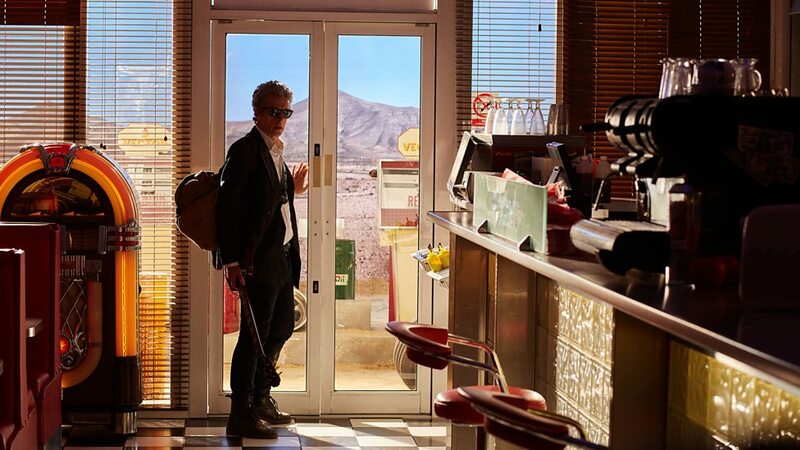 Two key scenes from the Series 9 trailer take on a whole new context when we see them in this story as well. 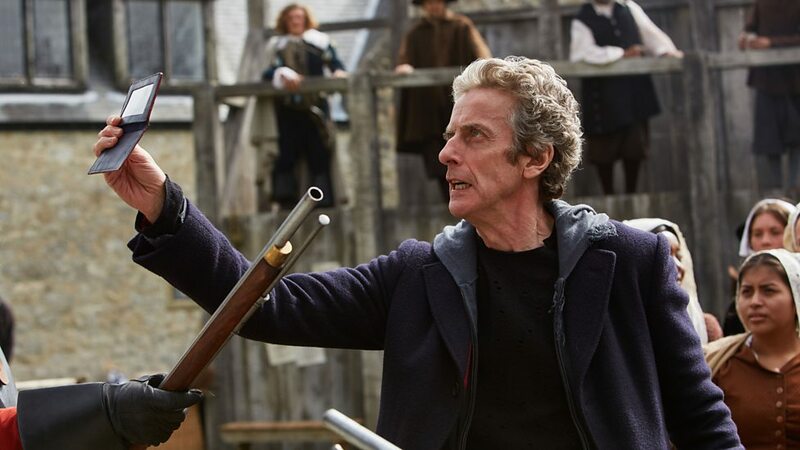 This unpredictable adventure is full of action, boasting strong performances from Peter Capaldi, Jenna Coleman, and Maisie Williams, the comedy skilfully melds with the darker undercurrents of the story, and the episode is superbly directed Ed Bazalgete (who also filmed some of Poldark this year). The Mire are huge lumbering creatures, their true features are hidden beneath their armoured helmets, these intergalactic warriors absorb the strengths of other war-like species, and they are one of the deadliest warrior races in the galaxy. They are led by the Odin-like figure, played by David Schofield, who gives a brilliant scenery chewing performance as the leader of The Mire, who uses his holographic face of Odin to address the village from the sky, as well as in person, to play on the Vikings belief in Odin. Using the Mire to select only the strongest Viking warriors, “Odin” actually kidnaps them to extract their adrenalin and testosterone, whish he uses to invigorate himself and the Mire warriors. The Mire costumes are very imposing and impressive, their real faces when revealed are quite gruesome, and they make fearsome adversaries. 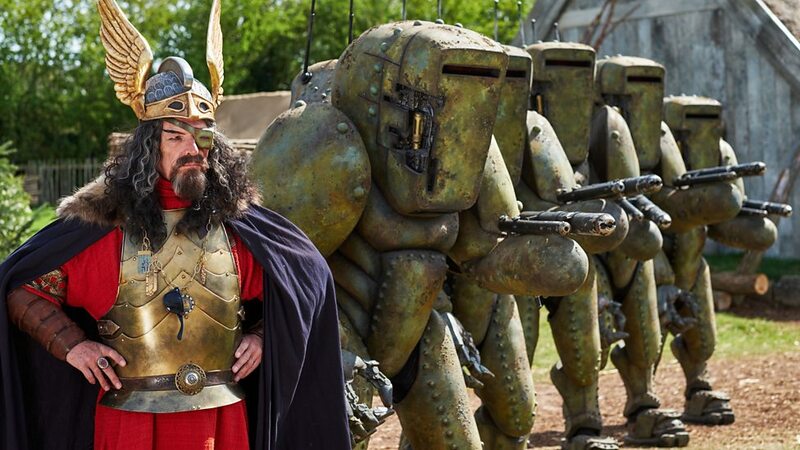 The Doctor has to become something of a false Odin if he is to get this group of villagers ready to face the armoured might of the Mire, and he’s only got one day to shape them into an effective fighting force. This leads to some of the episodes funniest scenes, as the Time Lord attempts to get the villages, Nollar (Simon Lipkin), Chuckles (Ian Conningham), Lofty (Tom Sourton), Limpy (Alistair Parker), Hasten (Murray McArthur), and Heidi (Barnaby Kay) ready to face the Mire. Fortunately, thanks to some timely baby speak, a few water barrels filled with electric eels, silvery fibres taken from Clara’s space suit, and Ashildr’s skill with puppets and storytelling, the Time Lord soon has everything he needs to turn the tables on Odin and The Mire when they arrive to do battle the next day. The Girl Who Died is full of fun references, the Doctor reverses the polarity of the neutron flow (a familiar phrase often used by the 3rd Doctor), the Time Lord now carries a 2000 Year Diary (very reminiscent of the Second Doctor’s 500 Year Diary from Power of the Daleks in 1966) he also poignantly speaks “baby” at several key moment in The Girl Who Died, a skill he used in A Good Man Goes To War and Closing Time (2011), and the line: “Time will tell, it always does…” echoes the 7th Doctor’s words when he was in a similar reflective mood in Remembrance of the Daleks (1988). 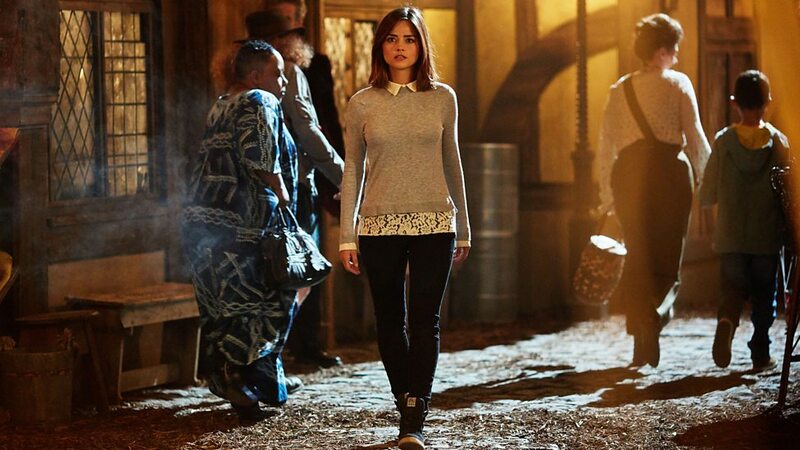 But after defeating the Mire – with their inept failure to defeat the Vikings on her phone recorded on Clara’s phone and set to the theme of The Benny Hill Show – the Doctor’s threat to upload the clip to the Galactic Hub and ruin the Mire’s reputation, quickly sends “Odin” and his lackeys packing. 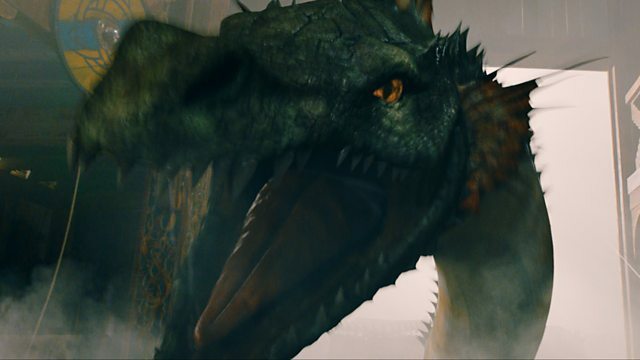 However, the price is high, and Ashildr dies of heart failure shortly after using the captured Mire warrior’s helmet the Doctor modified to enable her to tell the Mire a story they would never forget – projecting the image of a dragon when in reality they were only facing one of her puppet creations. This leads to the fantastic surprise ending that makes The Girl Who Died so special. Although he plays the 12th Doctor now, Peter Capaldi actually made his Doctor Who debut as the character Caecilius in the 10th Doctor story from Series 4, The Fires of Pompeii (2008). Ever since Deep Breath (2015) the 12th Doctor has long wondered why his regeneration gave him this face, now in The Girl Who Died the explanation is revealed at last! Following Ashildr’s death, when the Doctor sees his face in one of the water barrels, we briefly flashback to the events of The Fires of Pompeii, and the Doctor finally realises his face is actually there as a very special reminder for him… This is a truly magical moment, one that fans of the 10th Doctor, and perhaps more significantly Donna Nobel, are sure to enjoy; as we discover why the 12th Doctor looks like Caecilius from The Fires of Pompeii. The Girl Who Died is an excellent story by Jamie Mathieson and Steven Moffat, the intricate plot is peppered with humour, seamlessly blended with themes of immortality and its consequences, and the though-provoking conclusion ingeniously blurs the edges of time itself with a brilliant cliff-hanger to round off the first part of this most unconventional two-part story. 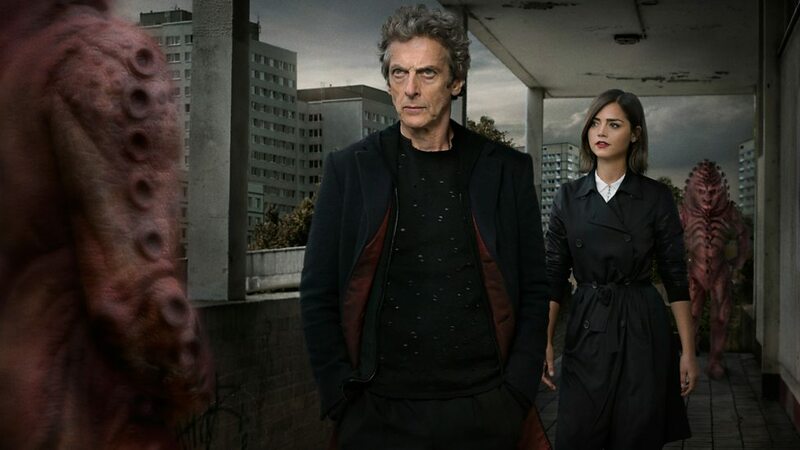 With its great setting, impressive cast, powerful alien menace, and high-production values, The Girl Who Died is another worthy addition to Series 9 and Peter Capaldi’s era as the Doctor. Before The Flood concludes Toby Whitehouse’s first two-part story for Doctor Who. The writer of Being Human (2008-20015) and the Doctor Who episodes School Reunion (2006), The Vampires of Venice (2010), The God Complex (2011), and A Town Called Mercy (2012), has returned for Doctor Who’s ninth series with Under The Lake & Before The Flood – a ghostly underwater time-travelling adventure directed by Daniel O’Hara that sees the Doctor and Clara facing haunting danger across two time zones. Trapped inside the lake-bed mining base The Drum in 2119, Clara (Jenna Coleman), second-in-command Cass (Sophie Stone) and Cass’s sign-language translator Lunn (Zaqui Ismall), now face the grim reality of the Doctor’s own ghost standing outside the base – and the Time Lord makes for a particularly disturbing looking spectre as he gazes through the window! 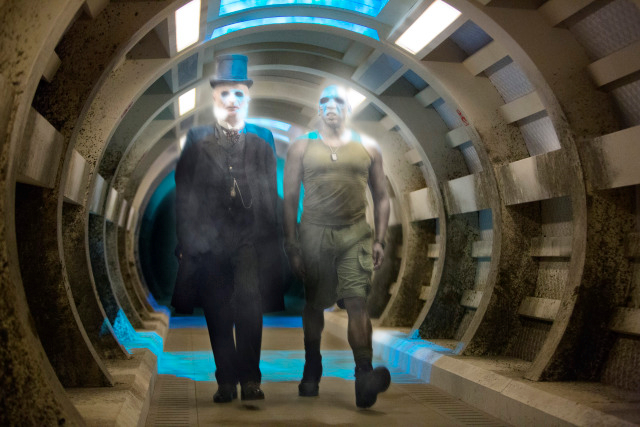 The cliff-hanger for Under the Lake saw the Doctor (Peter Capaldi) becoming a hollow eyed phantom, just like commander Moran (Colin McFarland), Vector Petroleum rep Prichard (Steve Robertson), and Parentis (Paul Kaye, who played Thoros in Game of Thrones), the mysterious top-hat wearing Tivolian (a species created by Toby Whitehouse for his 2011 Doctor Who story The God Complex). Clara and the crewmembers notice the Time Lords ghost is silently speaking their names instead of the coordinates like the other ghosts. The Doctor telephones Clara from the TARDIS, trying to reason with his own ghost, but the Doctor’s spirit releases the other ghosts trapped in the Faraday Cage. With the mystery of the spaceship with the indecipherable writing on its walls in the main hanger and whatever is sleeping inside the recently recovered suspended animation chamber remaining unresolved in 2119, the Doctor, systems technician O’Donnell (Morven Christie), and marine geologist Bennett (Arsher Ali) have been exploring the same site in 1980 before the dam burst and flooded the old town. 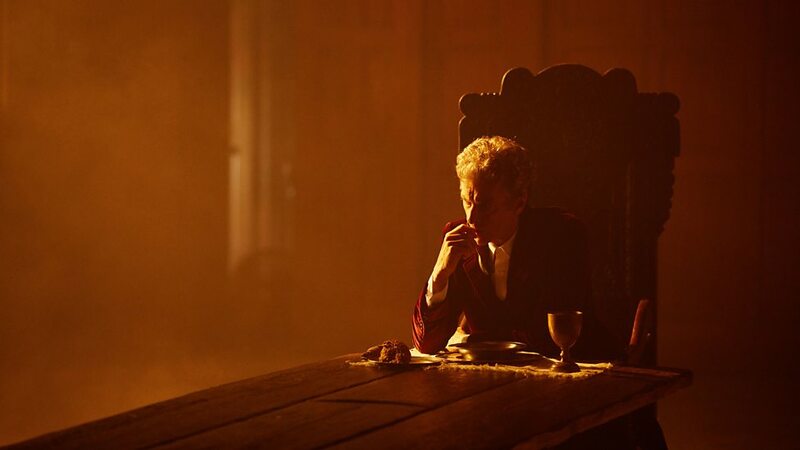 The Doctor certainly faces a difficult task, he’s confronted with tragedy, the bizarre anomaly of being stuck in his own time line, and a towering new enemy – the Fisher King. But it is the telephone call the Doctor and Clara have across the waterlogged centuries that divide them which confirms the Time Lords worst fears; he will have to die to save the day. Its already happened, Clara has seen the Doctor’s ghost in the future, there’s no escape from his fate, or is there..? This is a fabulous episode for Peter Capaldi and Jenna Coleman as the Doctor and Clara face their most challenging adventure yet, and there are some highly emotional scenes between them – particularly during their timey-wimey phone conversation before Clara, Cass, and Lunn, have to take refuge in the Faraday Cage from the ghosts. Clara has become a bit of a thrill-seeker recently, enjoying the danger that accompanies the Doctor’s adventures. Before The Flood really highlights the profound effect that travelling with the Doctor has had on Clara since Danny’s death, now she has to contemplate the possibility that the Doctor might also die; and these moving scenes reveal just how much Clara’s friendship with the Doctor means to her. Toby Whitehouse has created some really great characters for this two-part story, the crew of the Drum are a highly-skilled team, and they all get a good share of the action in Before The Flood. Sophie Stone, the first deaf actress in Doctor Who, gives a terrific performance as Cass, whose lip-reading skills and lack of hearing gives her a pivotal role in the unfolding drama. Zaqui Ismall also plays a key role as Lunn, Cass’s designated sign language translator, the ghosts won’t harm him because Cass wouldn’t let him read the strange writing inside the alien vessel, and this proves vital in getting Clara’s phone back from the ghosts. There’s also a powerful scene between Clara and Cass after Lunn bravely sets out from the Faraday Cage to retrieve the phone (the only way they can maintain contact the Doctor in the past), it’s a brilliantly scripted moment, and one that is in no needs of translation either! The Doctor, O’Donnell, and Bennett soon discover the alien craft in 1980 on the military training site in Scotland – modelled on a Russian town – was used train troops at the height of the Cold War. It seems the craft is actually a hearse, carrying the body of the Fisher King, the suspended animation chamber and power cell are still intact, and there are no signs of the untranslatable writing on the walls – at least not yet… We also get to see a lot more of the dapper top-hat wearing Tivolian, Parentis, played by Paul Kaye, and discover the intergalactic undertakers role in events here in 1980 before he is killed by the revived Fisher King – who then inscribes the symbols that will make the ghosts into transmitters on the interior of the ship. O’Donnell’s zeal for adventure also sadly leads to her untimely death, whereby events take a dramatic turn which even the TARDIS won‘t allow the Doctor run away from. Meanwhile, Clara, Cass, and Lunn must venture outside the safety of the Faraday Cage in the future with homicidal ghosts and an undead version of the Time Lord stalking the base, as Bennett and the Doctor clash bitterly over the Time Lord’s actions in the past concerning O’Donnell, but what exactly has Beethoven’s Fifth got to do with ghosts in the 22nd century, and is the Doctor really powerless to stop the Fisher King’s plan to ensure his own survival? The monstrous Fisher King is a fearsome creature. It has taken three people to bring this lumbering alien to life on screen. Neil Fingleton is the man inside the creature costume, and at over 7ft 7in, he’s also Britain’s tallest man. The Fisher King is voiced by the award-winning actor and comedian Peter Serafinowicz (He was the voice for Star Wars Episode I villain Darth Maul, the actor also played Pete in Shaun of the Dead, and Denarian Saal in Marvel‘s Guardians of the Galaxy), and the creatures blood chilling roar is provided by Corey Taylor – the lead singer of the metal band Slipknot. The Fisher King is a truly terrifying foe, the monsters scenes with the Doctor are electrifyingly tense, and their epic showdown resonates across time and space. 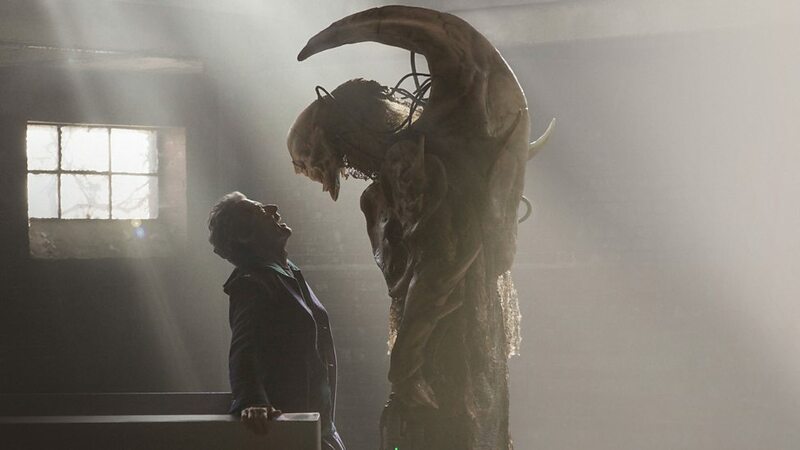 The Fisher King is without doubt one of the most dangerously powerful creatures the Doctor has ever faced, and their face-off is a magnificently menacing scene. There are some really dark moments of horror on The Drum as well, particularly when Lunn has to venture out alone to face the ghosts in the shadowy corridors, and later, when Cass is wandering alone, she is followed by Moran’s axe wielding ghost – a scene made all the more terrifying because Cass cannot hear the axe being dragged along the corridor behind her. O’Donnell makes a number of references to the Doctor’s past companions and exploits in this episode. Unfortunately her enthusiasm also puts her in terrible danger, she gets killed by the Fisher King and joins the ranks of the ghosts on The Drum menacing the others, and sadly she will never know how much Bennett really cared for her. 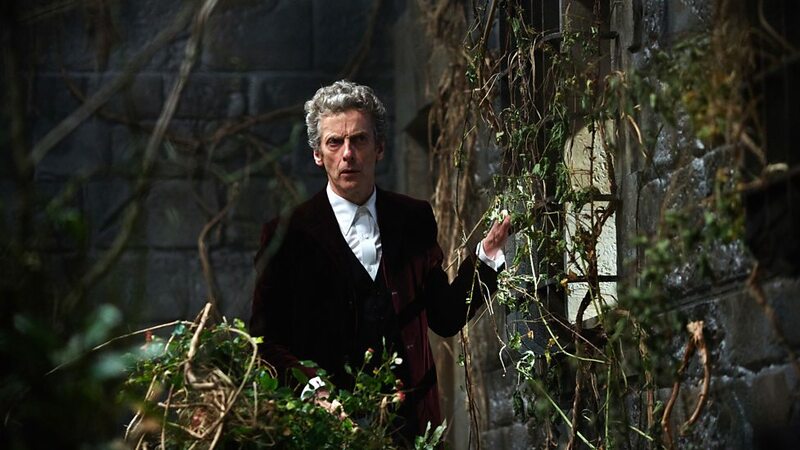 With the consequences and destruction set to spiral out of control, the Doctor sends Bennett back to the TARDIS while he confronts the Fisher King. 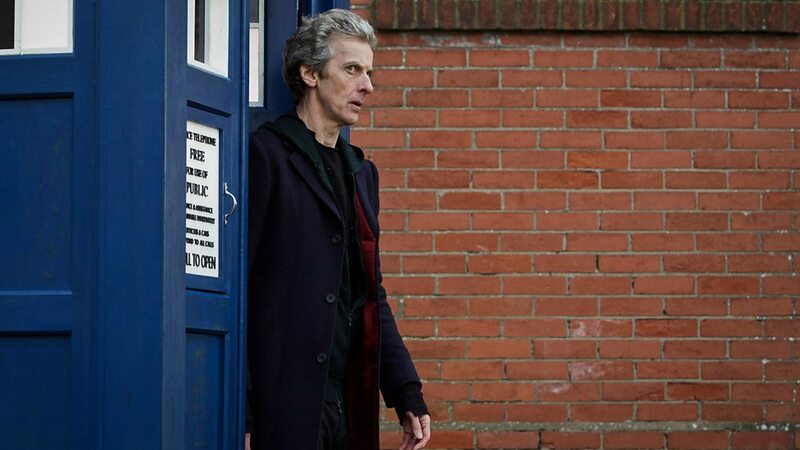 The Doctor tricks the alien warlord into leaving the church and the suspended animation chamber behind. Outside the creature discovers the missing power cell the Doctor has placed, which detonates, destroying the dam and flooding the entire area – killing the Fisher King. It’s only really here in the closing stages of the story that things get a little muddled. The time-twisting resolution, with the Doctor emerging from the suspended animation chamber in the future on The Drum, together with a little help from his sonic shades and a neat trick with his cleverly programmed ghost / Doctor / hologram, does all feel a little contrived, but Toby Whitehouse manages to tie everything up so well everything almost reverse engineers itself to paper over the cracks. With the ghosts trapped in the Faraday Cage for UNIT to sort out, romance in the air for Cass and Lunn thanks to Bennett, and the Doctor’s timey-wimey bootstrap paradox laden explanation for Clara everything wraps up in fine style to the strumming of the Doctor’s electric guitar. Before The Flood is structured around some brain wracking concepts and leaps of logic. I’m certainly not even going to pretend I understood all of it either, but like the Doctor said, you can always google it if you really want too! There are a wealth of continuity points and fun references to look out for, including such things as the brand name of the Doctor’s amplifier for his guitar, and the fun slogan on Prentis’ business card! While not quite as good as Under The Lake, Before The Flood still provides a breathtakingly exciting conclusion to this story, and Toby Whitehouse’s excellent multi-layered scripts for Under the Lake & Before The Flood mixes deep-sea adventure, with time travel, and ghosts to make this one of the highlights of Series 9. Boasting strong performances from the entire cast, with some clever 4th wall shattering moments from Capaldi’s Doctor, a menacing monster, stunning special effects, an amazing rock version of the opening theme tune, and the brilliant direction by Daniel O’Hara, this two-part story recaptures the essence of the classic series and seamlessly blends it with the fast-paced excitement of the new series to forge something very special indeed! And just for fun here’s that rock version of the Doctor Who theme! Under The Lake continues the dark tone of Series 9, with the beginning of a two-part story by writer Toby Whitehouse. The Being Human (2008-20015) and Cold War drama The Game writer has already written several outstanding episodes of Doctor Who: including School Reunion (2006), The Vampires of Venice (2010), The God Complex (2011), and A Town Called Mercy (2012). Now Toby Whitehouse is back for Series 9 with the new episodes Under The Lake & Before The Flood, a spooky sci-fi ghost story which also has the added distinction of being Toby Whitehouse’s first two-part Doctor Who adventure. The TARDIS materialises inside The Drum three days later, but it seems she’s not at all happy about landing here. Clara might soon get her wish for more adventures, monsters, and things blowing up, when they encounter two decidedly homicidal ghosts. Taking refuge with the crew hiding inside a Faraday Cage – the only area the ghosts cannot enter while the base is in night mode – the Doctor learns the area was a military training site before the dam burst and flooded the valley, and now Vector Petroleum have acquired the rights to mine the oil reservoir beneath it. Peter Capaldi is on excellent form here as the Doctor, especially when the Time Lord takes charge of the situation, enthusiastically theorising about both the existence and the prospect of dealing with genuine ghosts for the first time. Jenna Coleman is also great as Clara and she is right in the thick of the action. The Doctor also begins to notice that Clara seems to be enjoying their adventures in Time and Space a little too much – it’s almost as if she has become addicted to danger that accompanies the Time Lords adventures. Toby Whithouse’s story tackles this issue in the superb TARDIS interior scenes between the Doctor and Clara as we discover why the time machine was so upset by the ghosts. It’s a sublime moment as the Doctor, quite literally puts the breaks on the whole adventure, and takes time out to address his duty of care to his companion in a moving scene that poignantly speaks volumes about how just strong their friendship has become. There are some fun moments to break up all the ghostly happenings though: the psychic paper quickly establishes the Doctor’s UNIT credentials, the Time Lord uses some specially prepared prompt cards to hilarious effect, the sonic shades also prove very practical when you are face-to-face with a ghost, classic monsters the Autons get a mention, and there’s a fun explanation for why the Doctor doesn’t have a radio in the TARDIS. Under the Lake has a great guest cast. The crew of The Drum are a mostly military team, commanded by Moran (Colin McFarland) who tragically becomes a ghost in the opening moments, and there’s also a corporate rep from Vector Petroleum named Prichard (Steve Robertson). Second in command Cass, has to step up and take charge of the crew, and her character, like Sophie Stone who plays her, is also deaf. Its great to see a deaf character served so well by the script, Cass’s sassy and confident, her disability is never made into a big issue, she plays a vital role in helping the Doctor understand what the ghosts want at a crucial moment and also helps in discovering the true meaning behind the unintelligible writing on the ships walls. 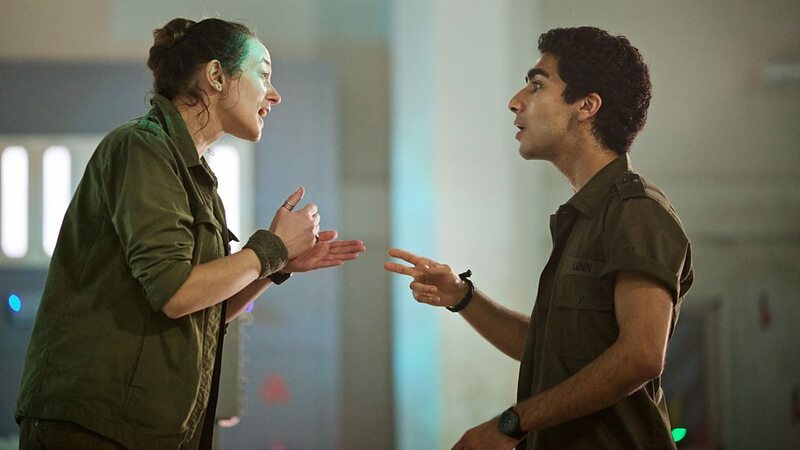 The rest of the crew is comprised of O’Donnell (Morven Christie) a systems technician who knows of the Doctor, the marine geologist Bennett (Arsher Ali), and Lunn (Zaqi Ismail) is the sign interpreter for Cass. There is a distinctive alien-looking ghost with a top hat in this episode, Parentis (Paul Kaye, who played Thoros in Game of Thrones), from a species the Doctor identifies as Tivolian, a being from the mole-like race that Toby Whitehouse invented for The God Complex – the character Gibbis (played by David Williams). The Doctor is clearly puzzled why a being from such a peaceful and subservient race as the Tivolian’s has become such a violent ghost. Indeed, special effects used are excellent. The ghosts in Under the Lake are all brilliantly spooky looking and are genuinely unsettling with their silent voices and blank eye sockets. There are some particularly scary ghost encounters with the crew, especially when Prichard returns to The Drum, Lunn also faces a terrifying moment when he gets trapped with a ghost, and the disquieting sight that greets Bennett when he takes a sneak peek inside a room where the ghosts are lurking is sure to send a few chills up the spine. There is one pivotal scene that also finally lets us in on what that brilliant: “Every time I think it couldn’t get any more extraordinary it surprises me. It’s impossible, I hate it, it’s evil, it’s astonishing… I want to kiss it to death!” line from the Series 9 trailer was really all about. The Doctor has faced ghost-like hauntings before, such as in the episode Hide (2013), but even he could be out of his depth against these underwater spirits! The ghosts begin using the base systems against them, even sending a fake message to call in a rescue sub. With the Drum in quarantine the crew attempt to catch a ghost! Playing a deadly game of cat and mouse in the corridors with the phantoms, Clara, Bennett, and Lunn lure the ghosts to the Faraday cage so the Doctor can finally confront them. The ghosts silent words are really coordinates, each death and ghost created has made the signal stronger, and the fourth part now pinpoints the source – a church in the old flooded military town. Using a remote controlled sub they recover the missing suspended animation chamber, and it becomes clear the untranslatable writing on the walls of the ship are insidiously connected to the ancient threat sleeping inside the chamber. Under The Lake provides an exciting and spooky opening to this two-part adventure. Toby Whitehouse’s story takes the classic base under siege story and splices it with numerous sci-fi / horror tropes. Although at times it does feel a little like an undersea mash-up of themes from The Impossible Planet, 42, and the Waters of Mars, Toby Whitehouse’s multi-layered story is nevertheless packed with standout creepy moments, some of which are actually quite disturbing, and there are plenty of grim deaths to keep us on our toes. This is also the first full-length episode to be produced by Derek Ritchie, having already been script editor on The Time of the Doctor (2013), Deep Breath (2014), Into The Dalek (2014), and The Caretaker (2014), along with the Five(ish) Doctors Reboot special (2013), and he’s done a fantastic job with Under The Lake as well. Director Daniel O’Hara skilfully builds the tension and menace, using the fantastic sets to great effect, and the clever use lighting makes this underwater base look really convincing. Under The Lake is a fantastic episode, it has all the hallmarks of a classic Doctor Who story, and I really enjoyed it. There’s also a complex time-bending mystery resting right at the heart of the story, it builds towards to what is possibly one of the most jaw-dropping cliff-hangers the series has ever had, and it sets the scene for a thrilling conclusion in Before The Flood.